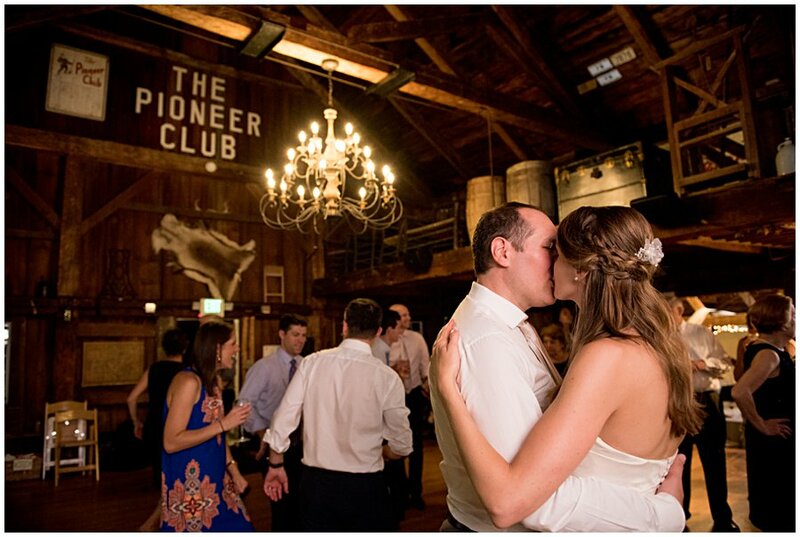 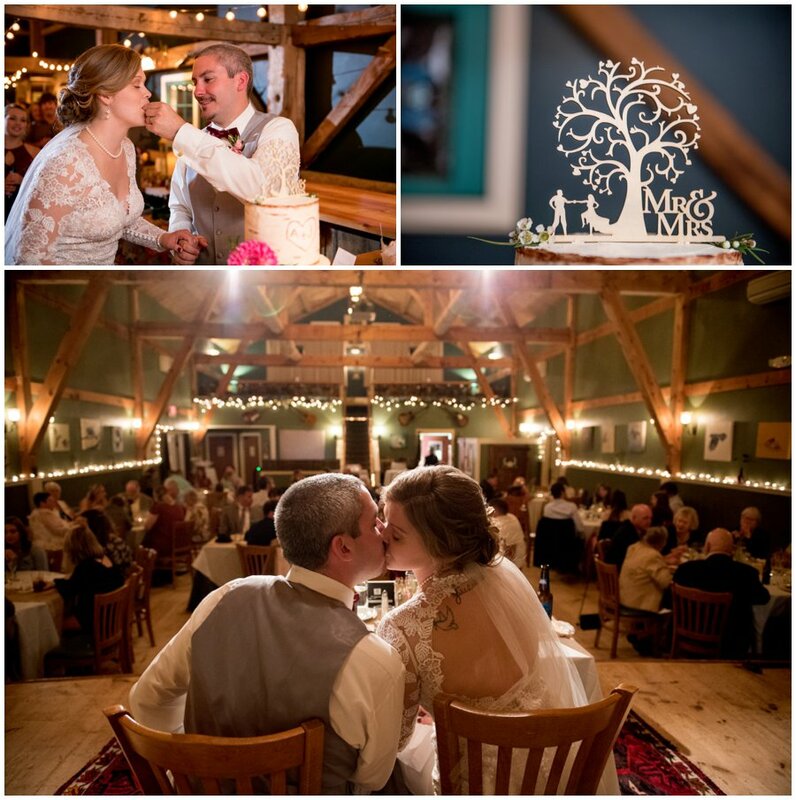 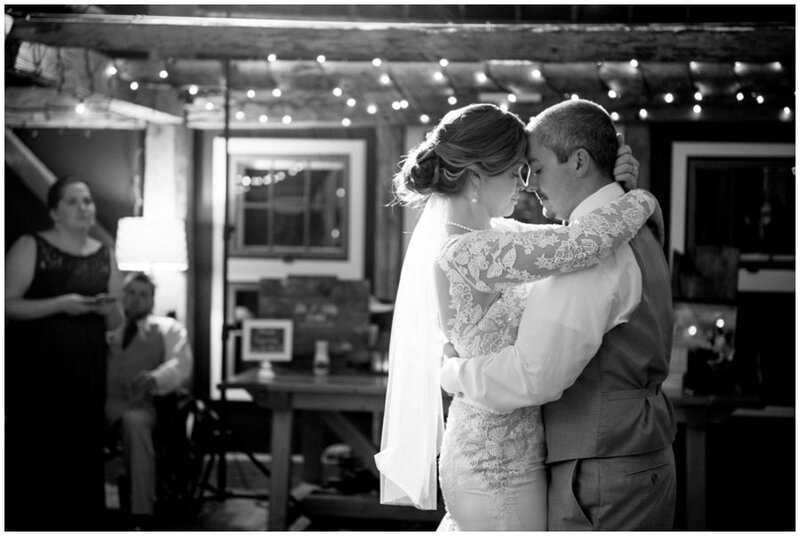 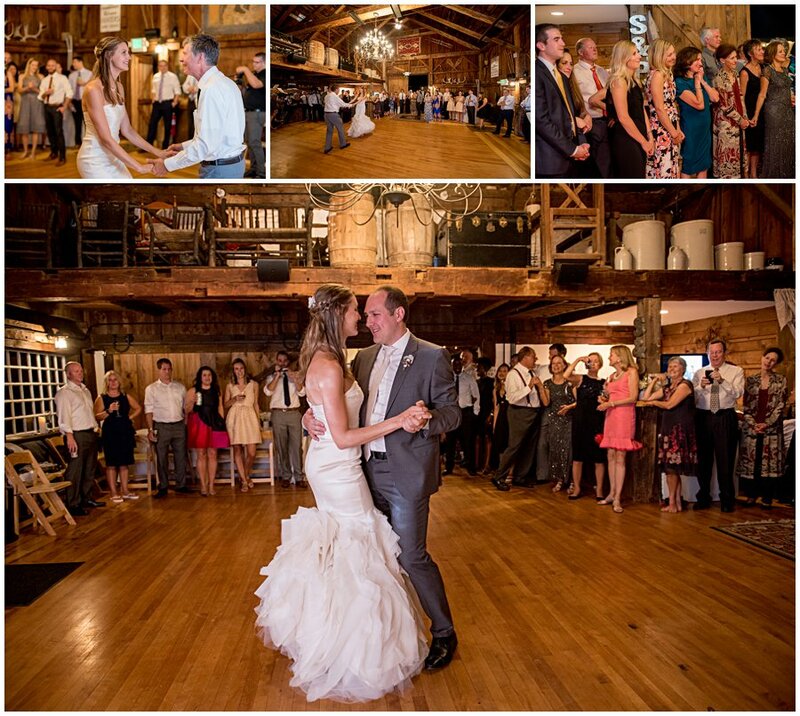 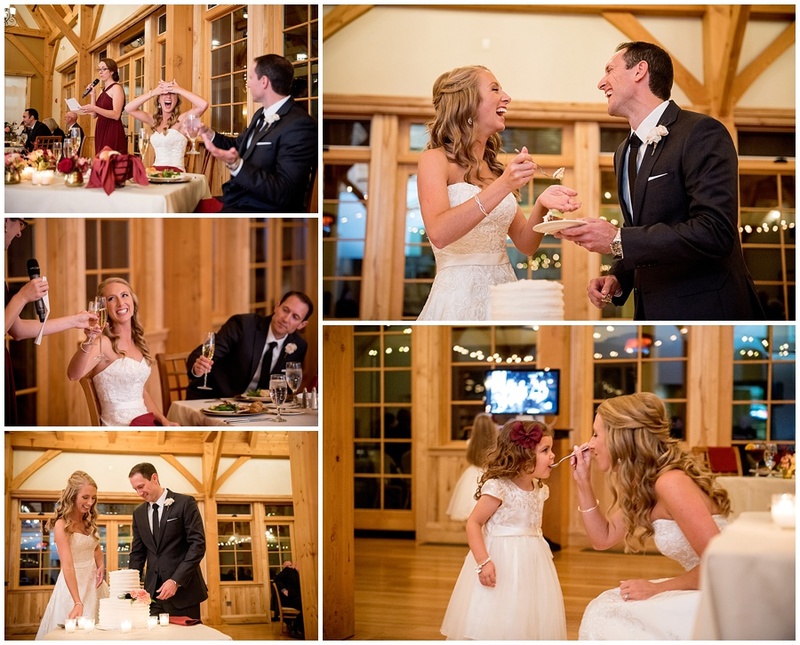 We discovered another amazing wedding venue up here in NH and it’s called The Pioneer Wedding Barn in Sugar Hill. 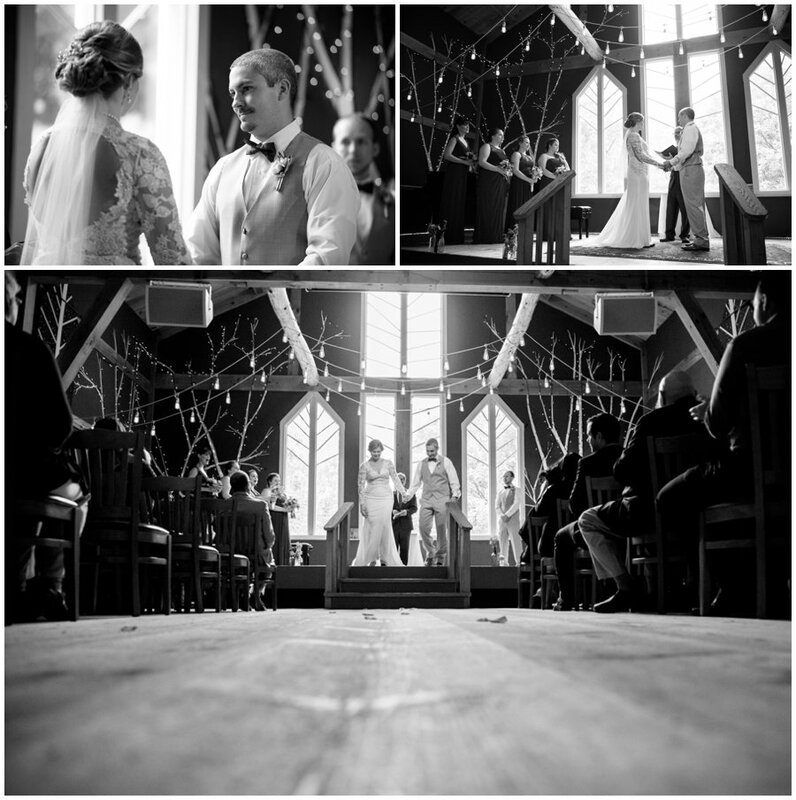 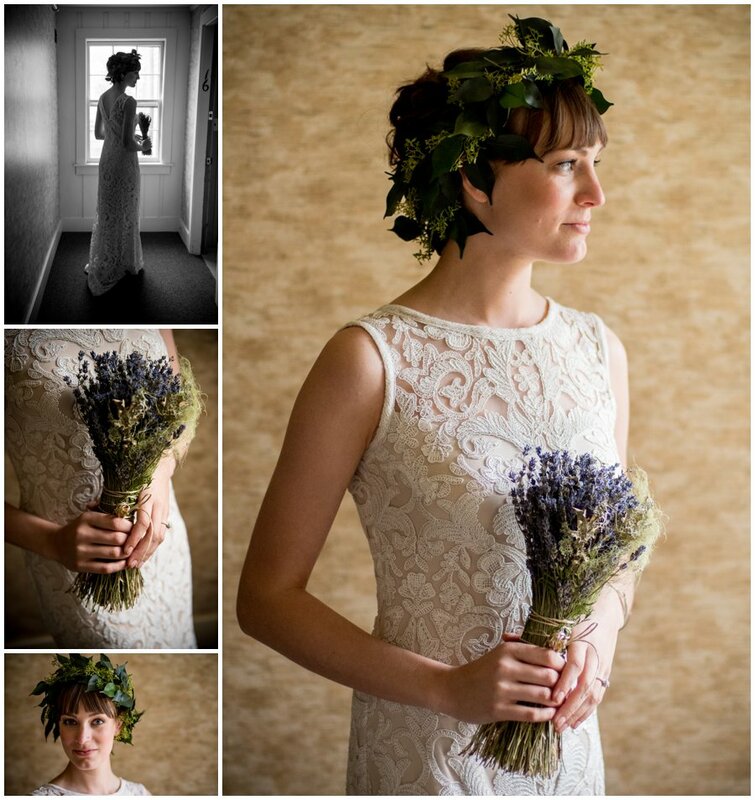 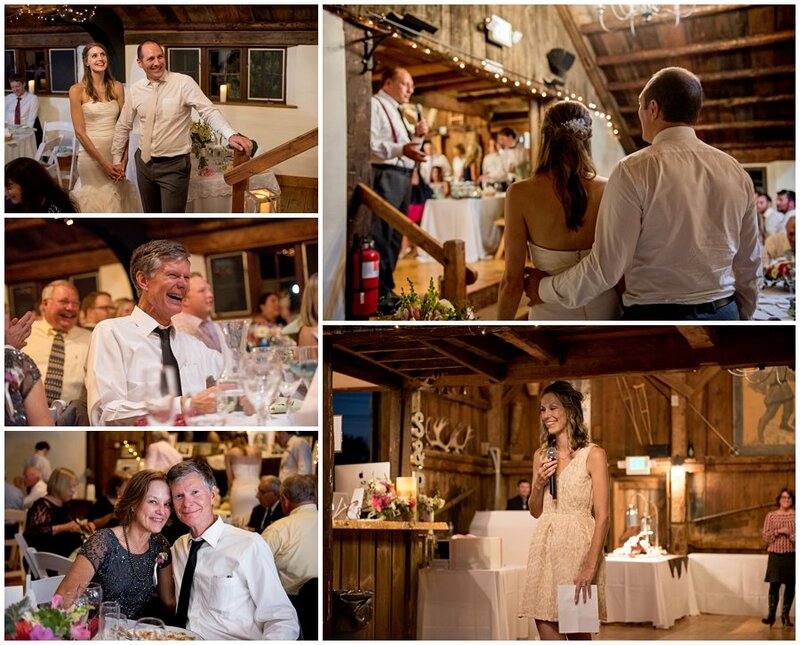 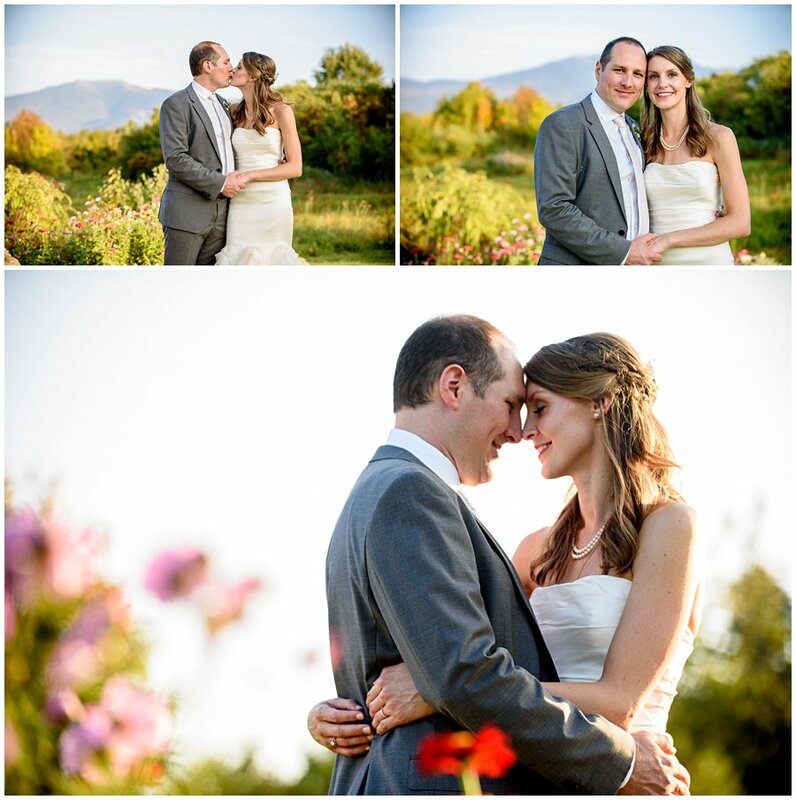 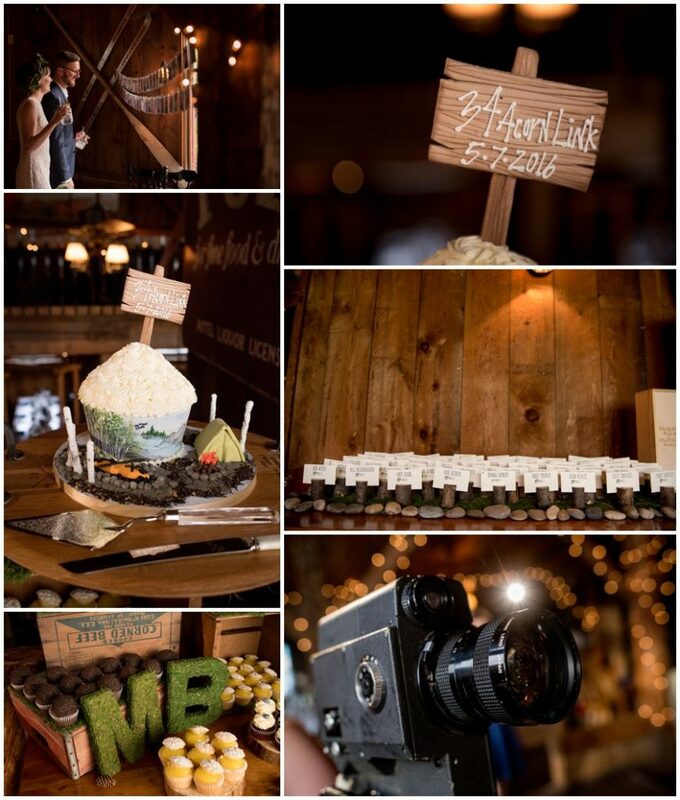 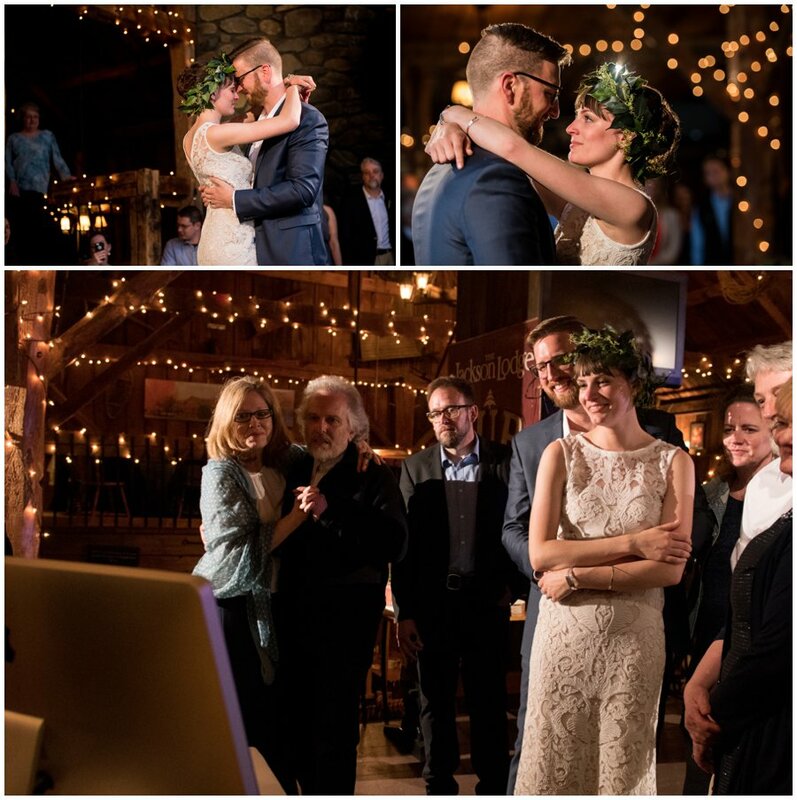 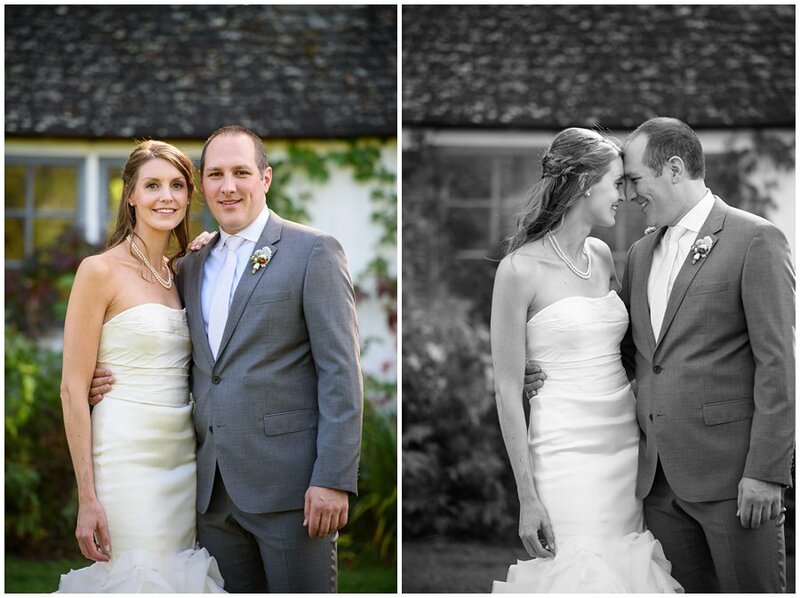 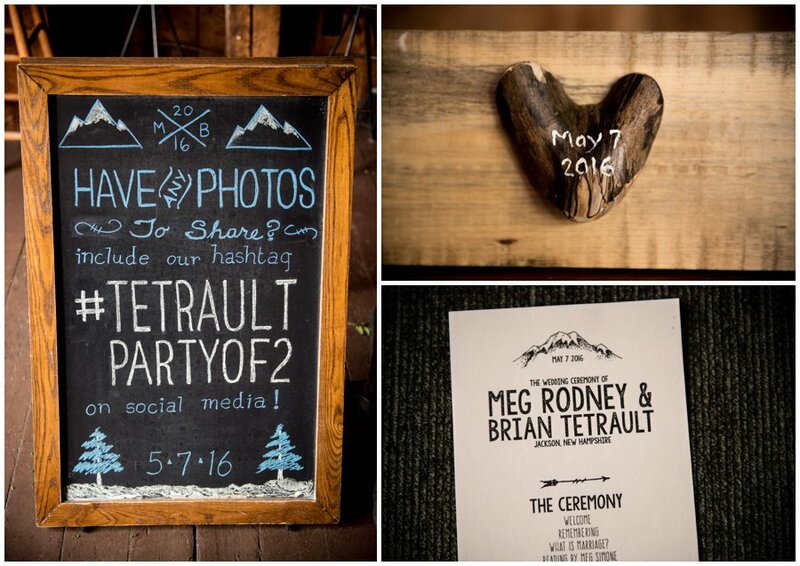 We owe a big thank you to Suzanne and Phil for having us as their wedding photographers at this beautiful venue! 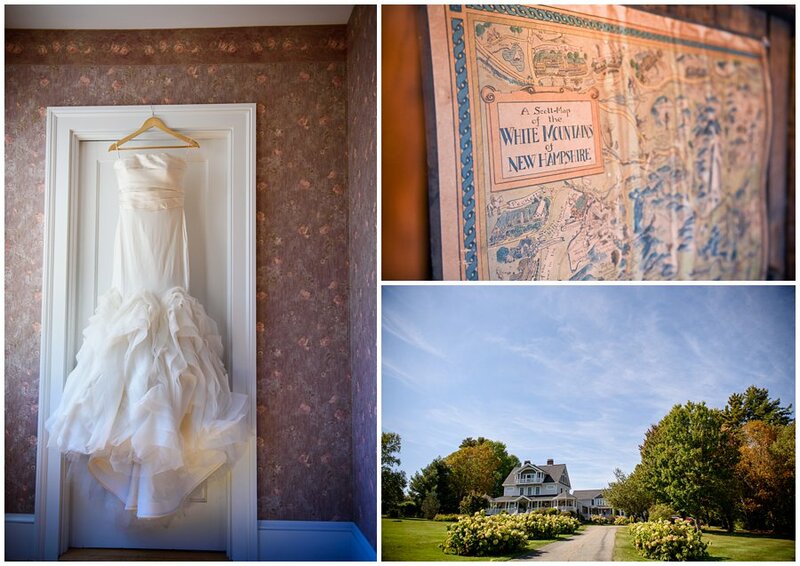 Up the road from the barn there just happens to be a beautiful bed and breakfast called The Victorian On Sunset Hill and it is quintessential northern New Hampshire in its charm, the wrap around porch, and amazing wallpaper! 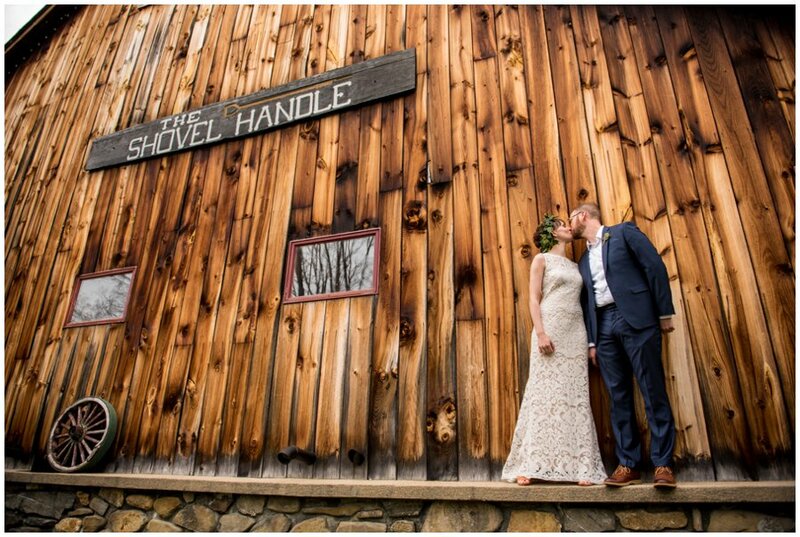 When we pulled up to the Inn for the getting ready and first look Mike and I were pretty giddy. 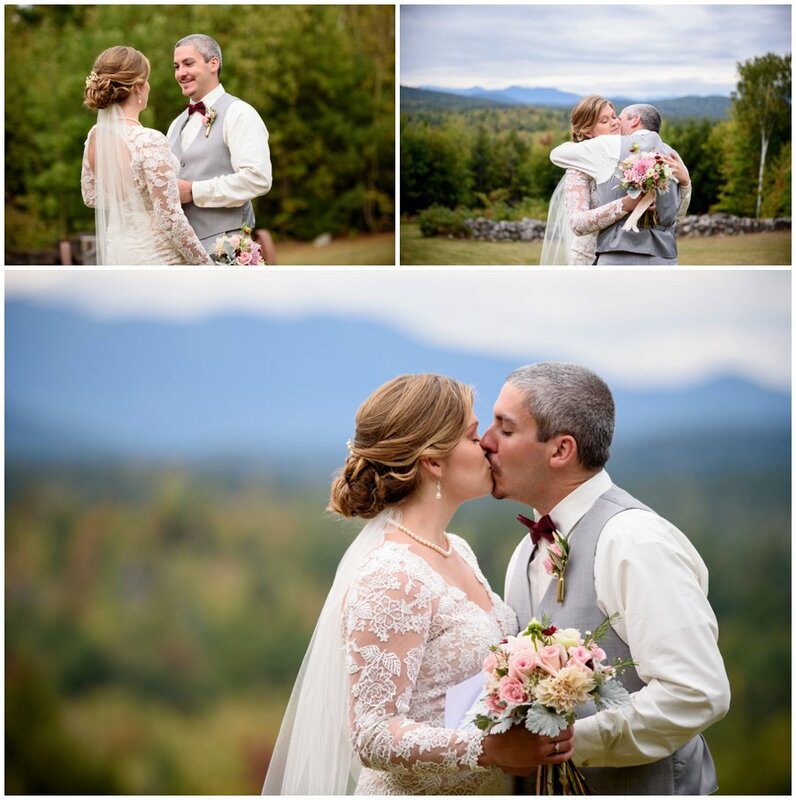 It was a beautiful September day and the sky was so blue and the mountain views were perfectly clear which isn’t always a given! 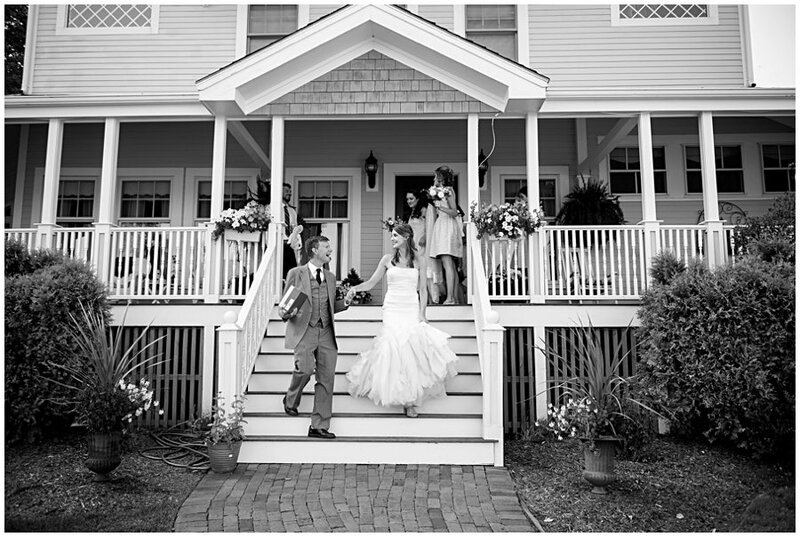 The first look with Suzanne coming down off the porch to tap Phil on the shoulder was perfect…and definitely made Phil tear up! 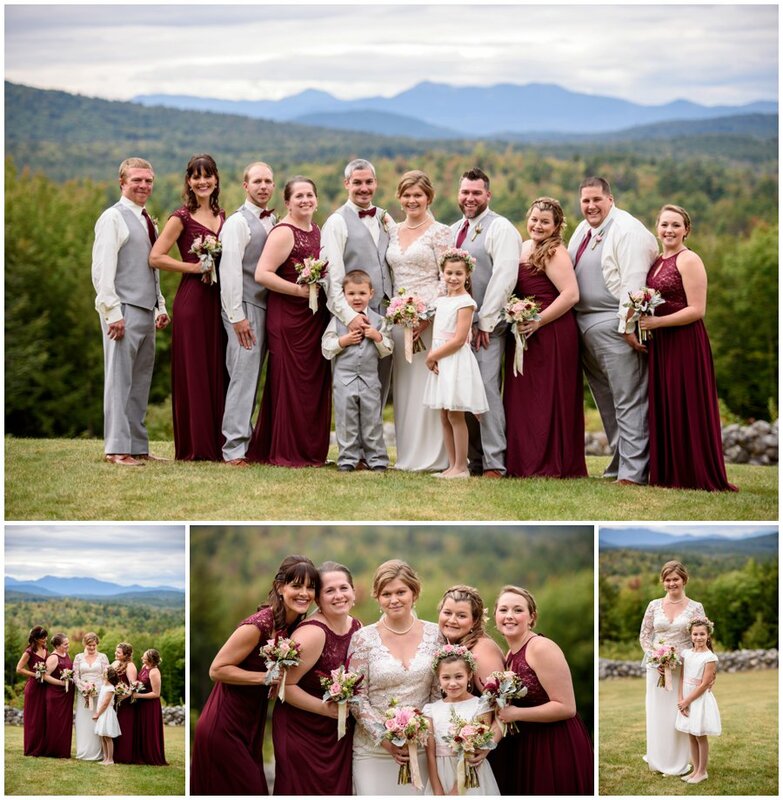 And then we did some formal bridal party pics–the Inn is located high up on a ridge overlooking mountains in every direction! 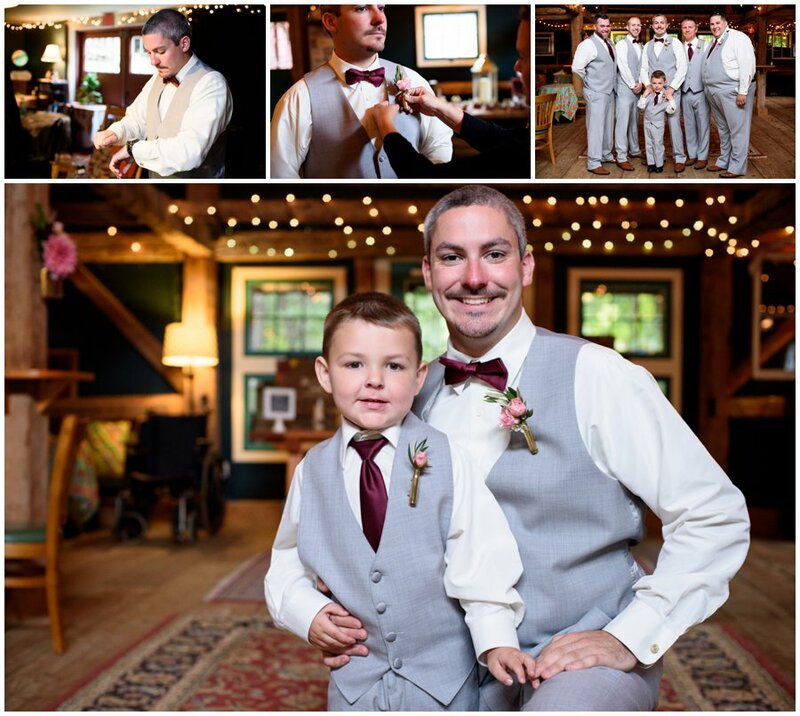 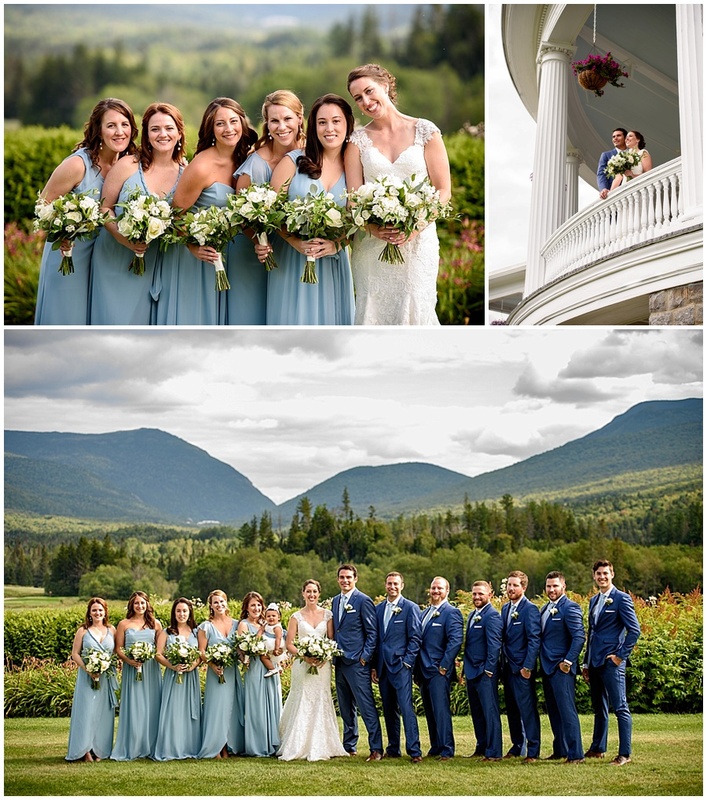 One of my favorite things about this whole day setup was that the Inn, the Chapel (St. Matthew’s Chapel) and the barn are all so close to one another that no time was lost sitting in cars and all of the guests really got to enjoy New Hampshire at its finest! 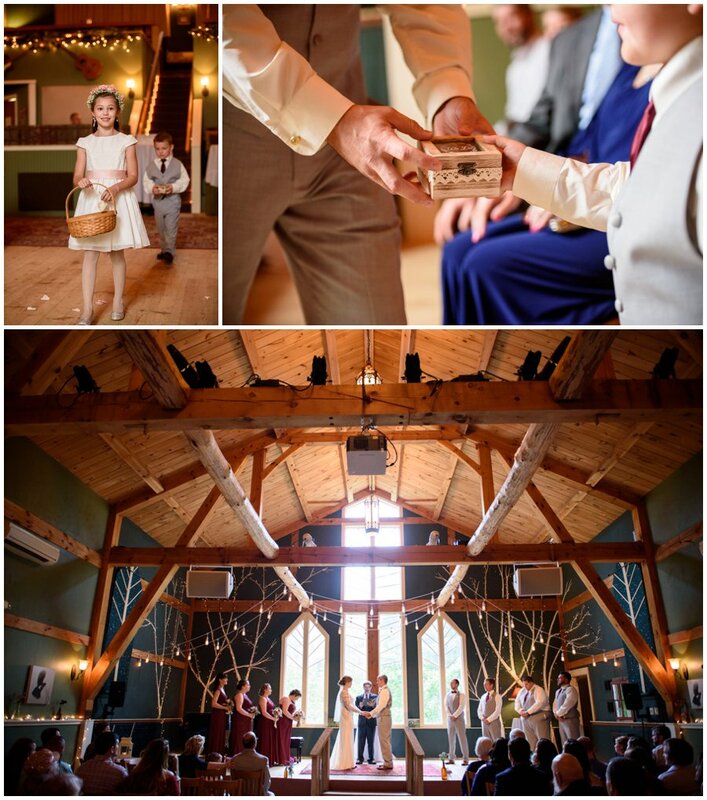 The Barn is a short walk from the Chapel and there are a lot of beautiful spots nearby which makes our job to capture the day as it unfolds easy! 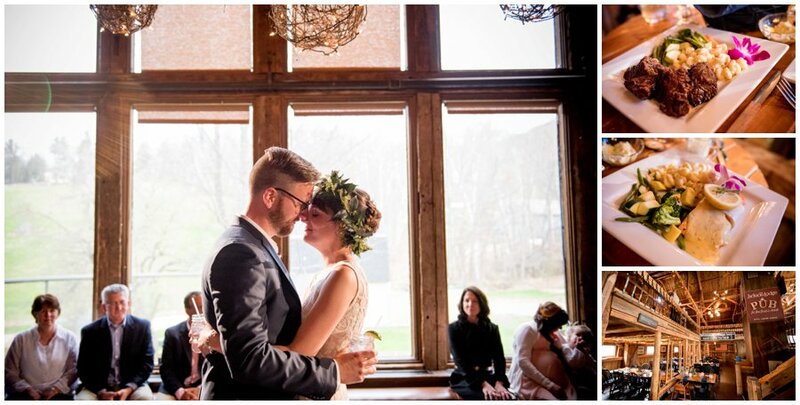 I think a highlight of the day for me was just how attentive Phil and Suzanne were to one another–checking in on each other’s needs throughout the day and really demonstrating love! 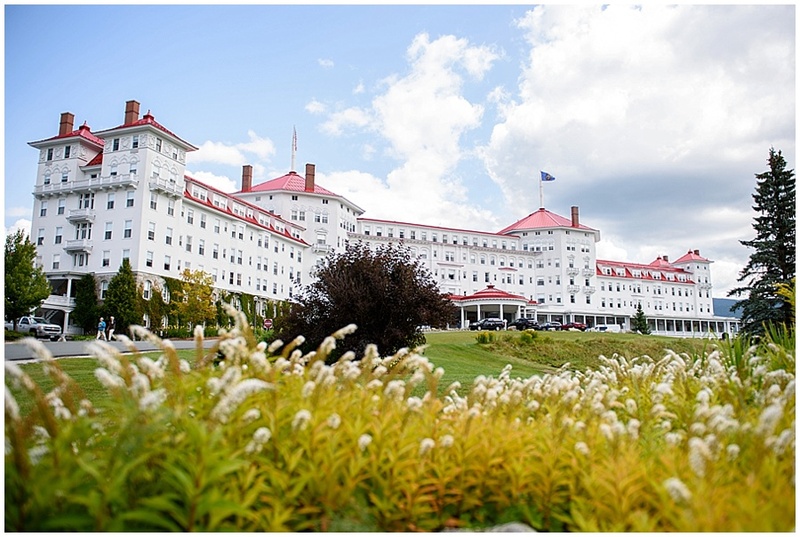 Have you ever stumbled upon something amazing that was practically under your nose and you never knew it was there? 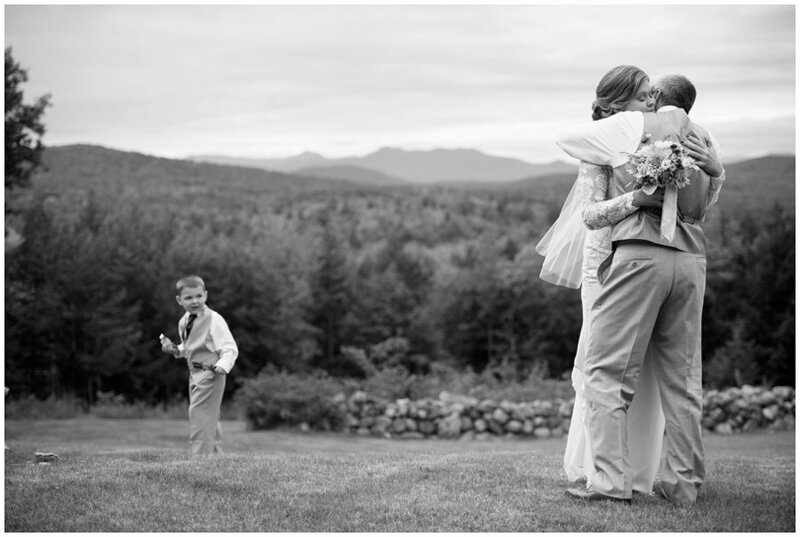 For me this year that was the Stone Mountain Arts Center in Brownfield, Maine. 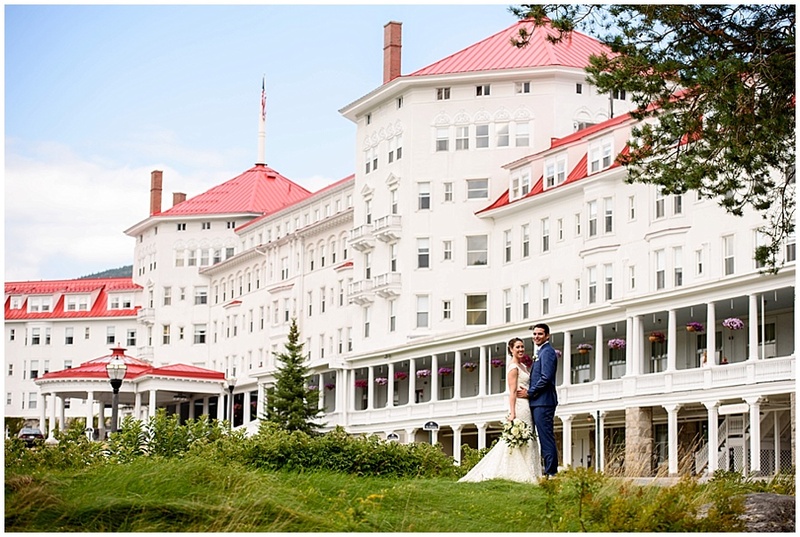 I think I need to send Ashley and John a dozen thank you notes for introducing us to this amazing place. 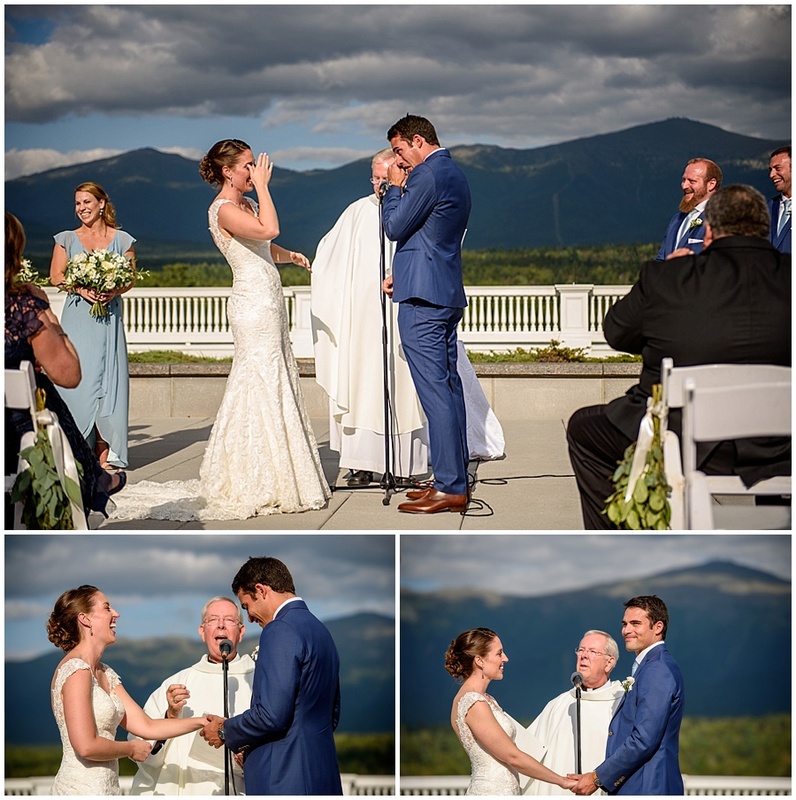 It’s funny because when we were moving up here to North Conway, NH it was in the middle of a pretty intense wedding season and we met this DJ who was telling us all about his condo up at Attitash Mountain and how much he loved working over in Maine at “SMAC” and at the time I had never heard of it. 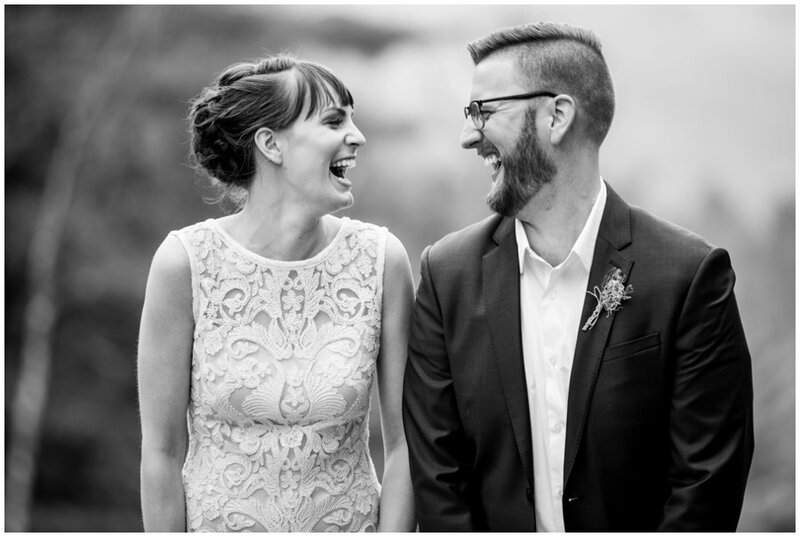 And then we booked a wedding there and we were super excited to see what this place was all about and we hit 10 levels above and beyond ourexpectations! 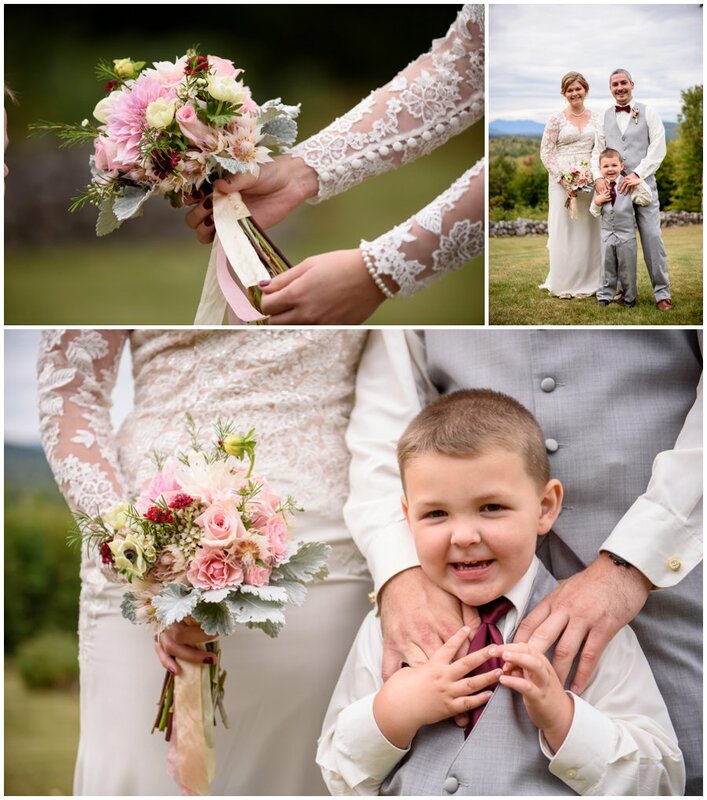 First of all, Ashley and John could not be a nicer couple…and with John’s tiny little side kick of a son we were all smile! 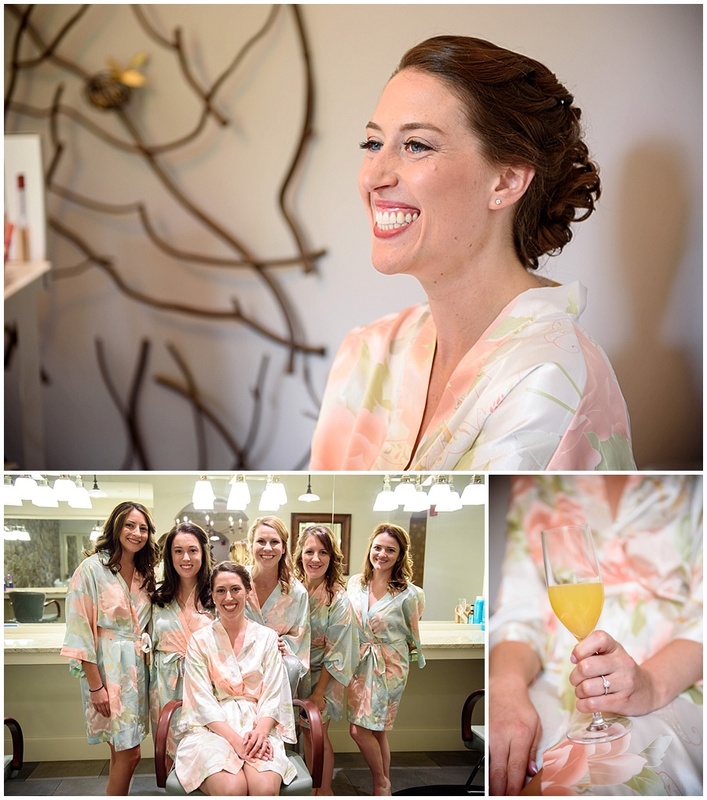 Not to mention the wedding was in and of itself an amazing day with such a fun bridal party. 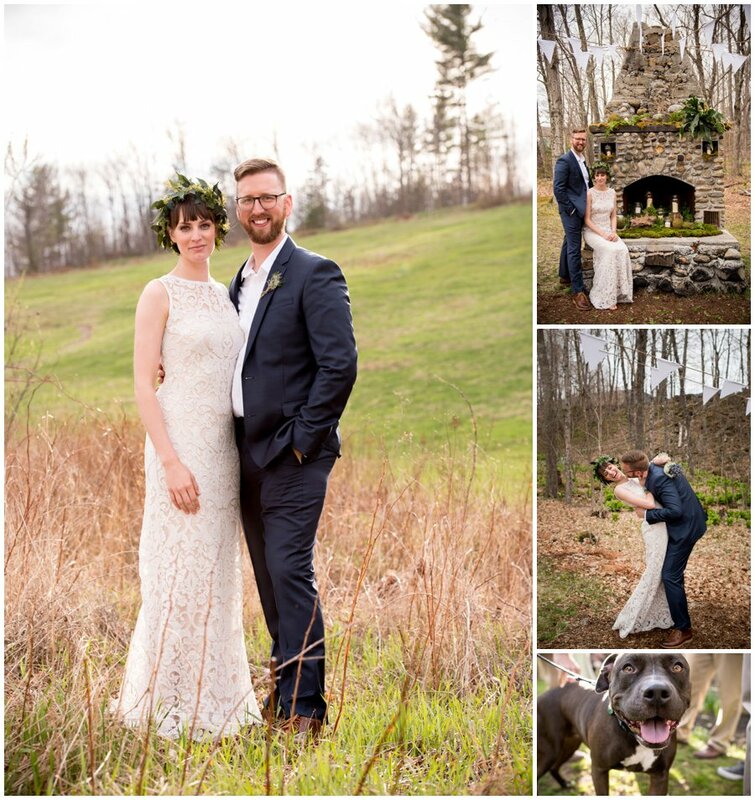 Once you add Stone Mountain Art Center’s awesome planner Hannah into the mix and you realize just what a well oiled machine this place is! 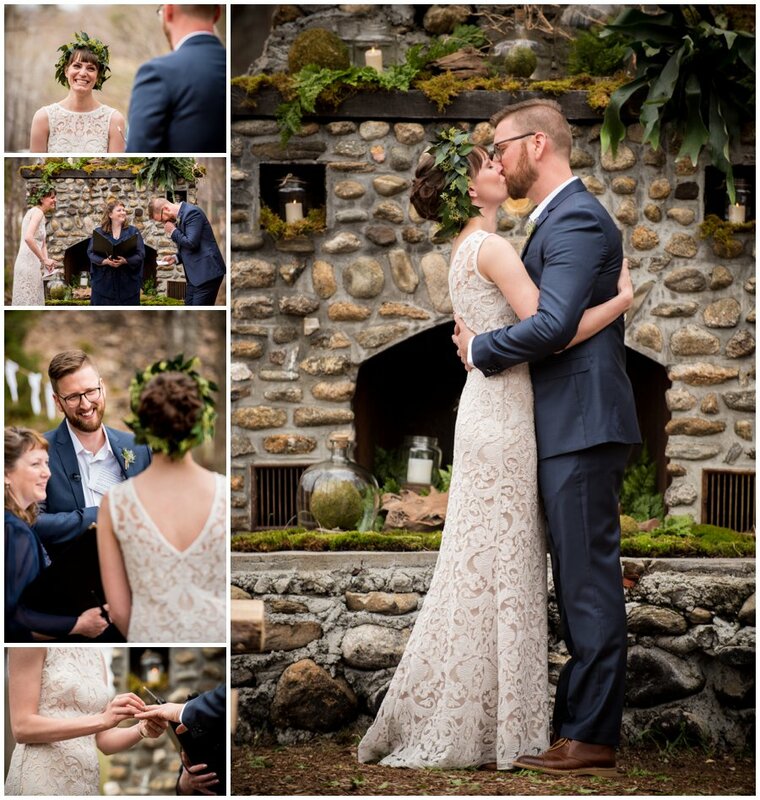 They really have this wedding thing down–the flow of the day was like that moment where all of the pieces of the puzzle just start clicking into place. 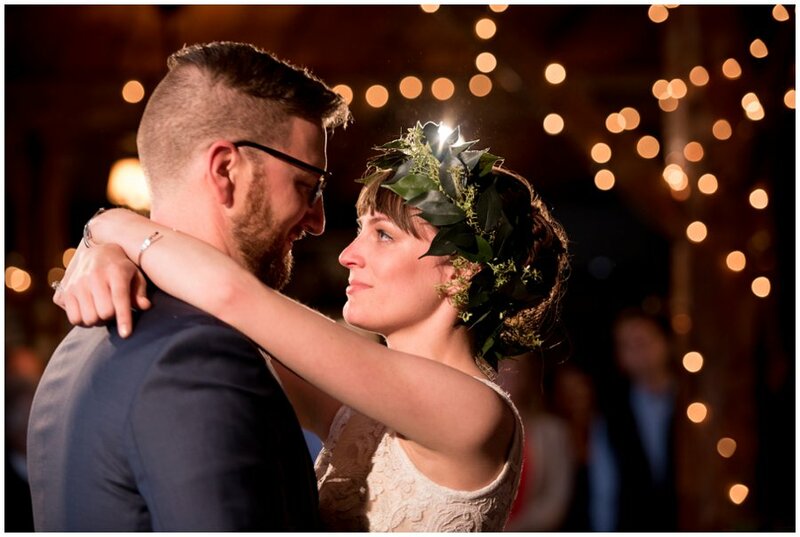 No one was rushed or behind or lagging or bored, it really just was supremely perfect timing with one thing flowing into the next and into the next. 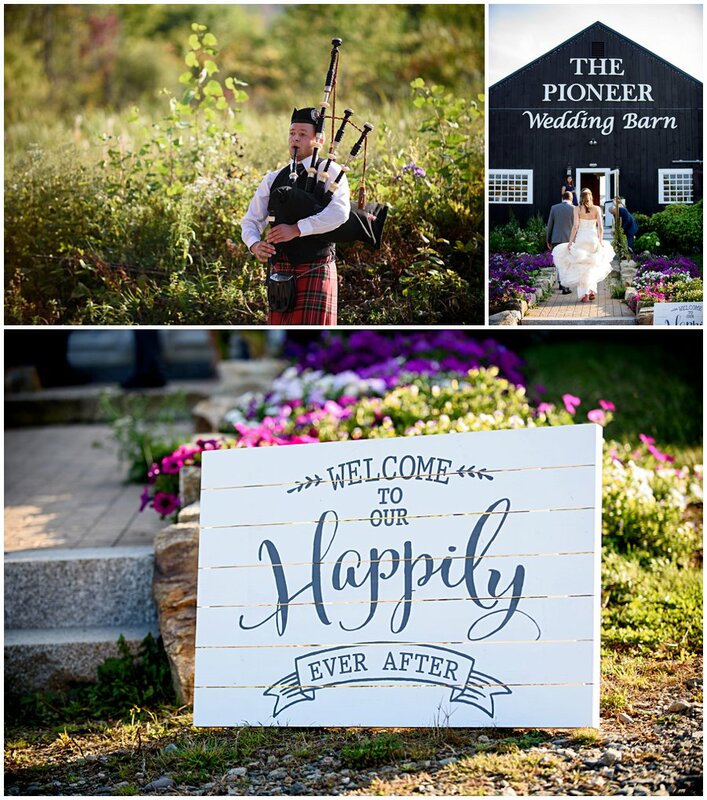 I’m pretty sure if we could steal their planner Hannah and bring her to all of our events she’d make the magic where ever she went! 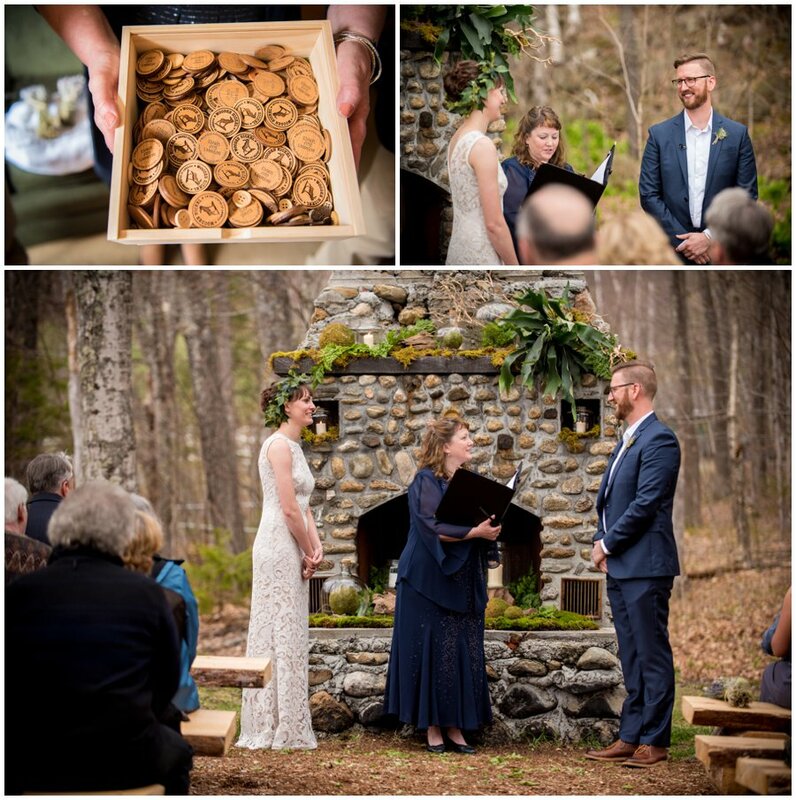 So, I hope you too find yourself at the Stone Mountain Arts Center for a wedding…but if you haven’t been invited to one of those they have a pretty amazing looking concert event calendar! 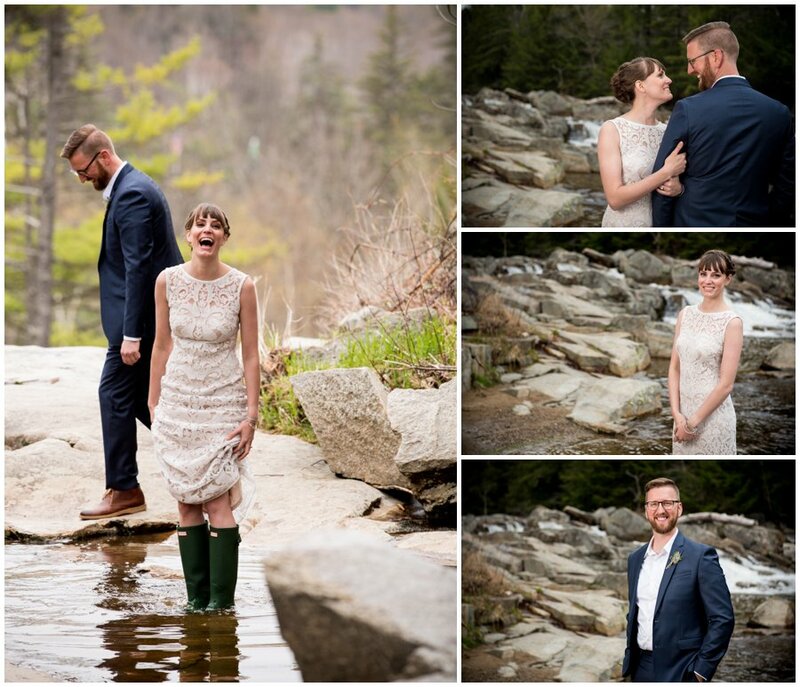 Enough of the words…you came here for the pictures! 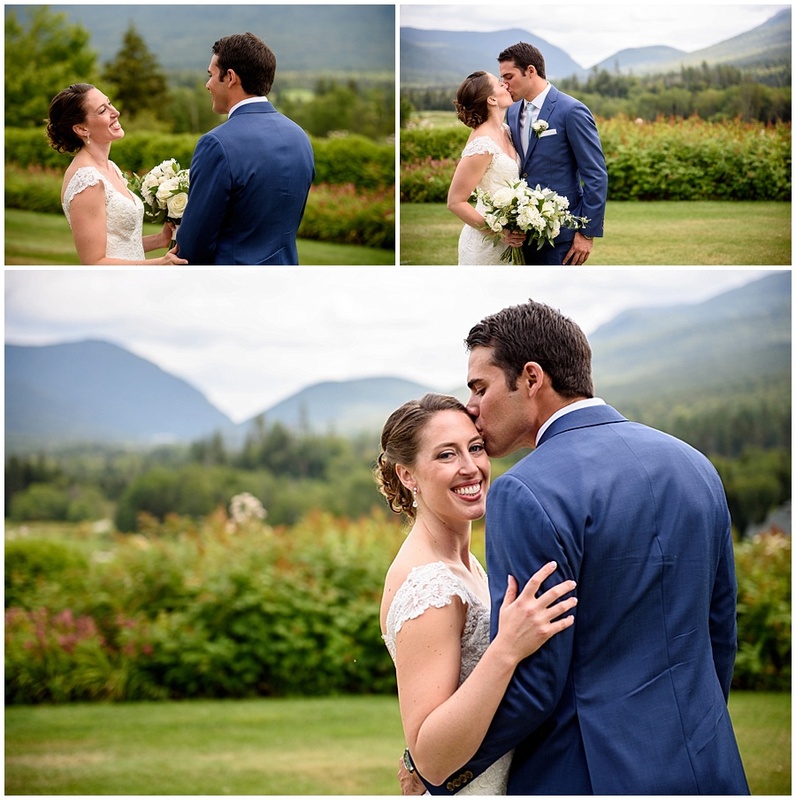 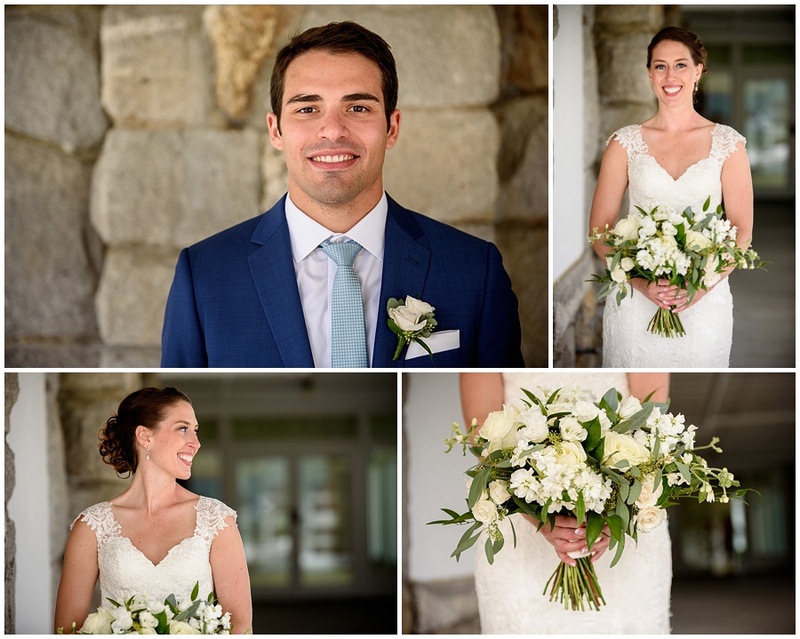 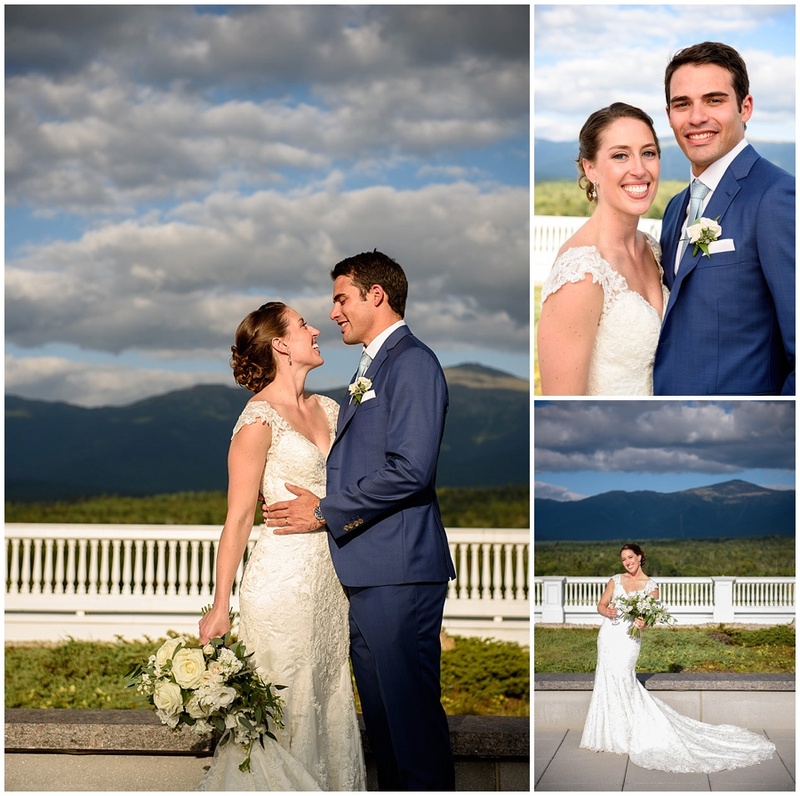 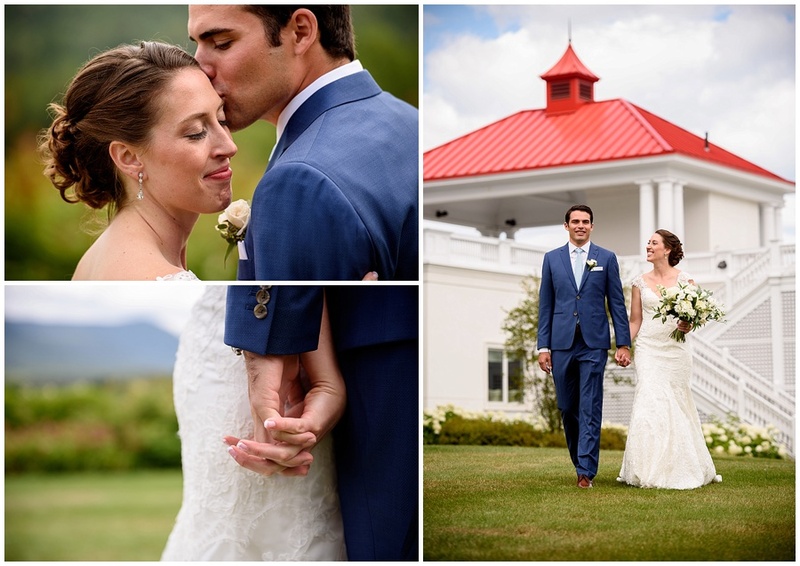 Lauren and Ian could not have asked for a more beautiful summer day to get married at The Omni Mount Washington Resort in Bretton Woods, NH. 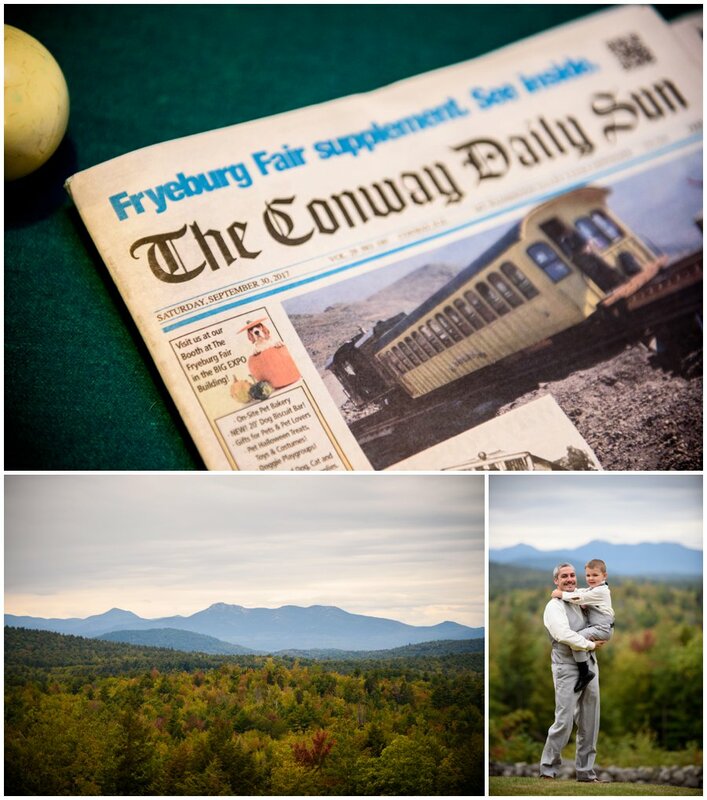 The fun thing for us is this venue is now just a 40 minute drive from our house in North Conway, NH. 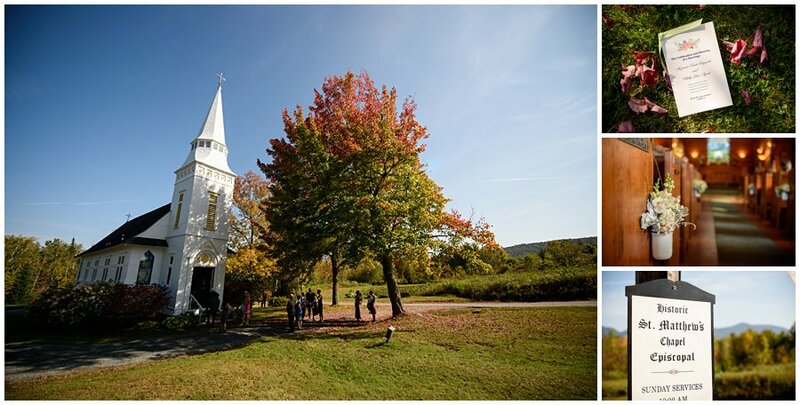 Even though we love to travel all over New England exploring different venues, there is something pretty magical about being so close to home! 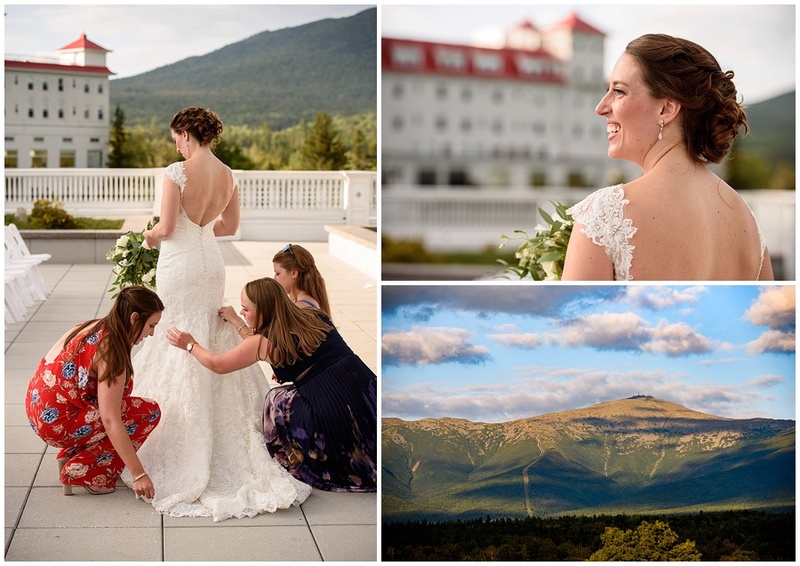 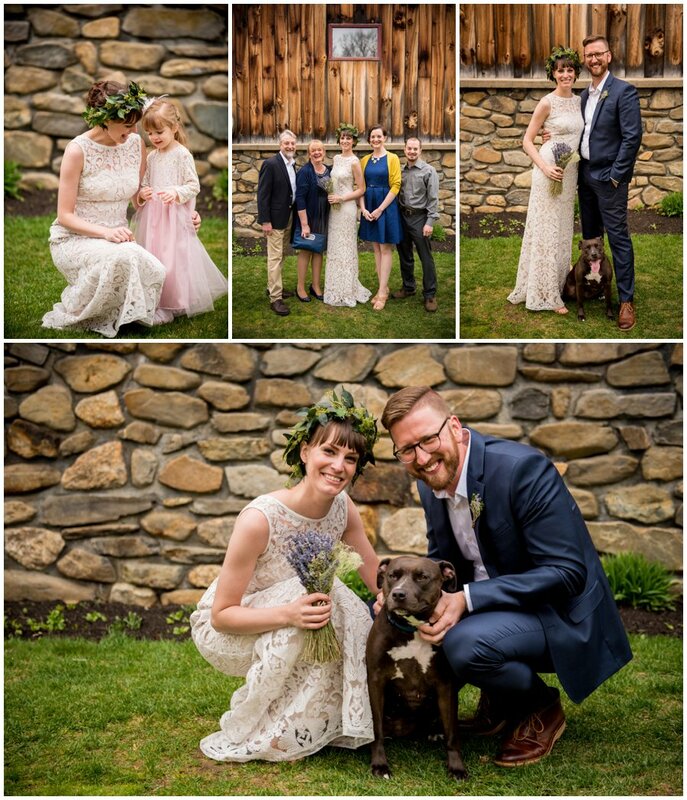 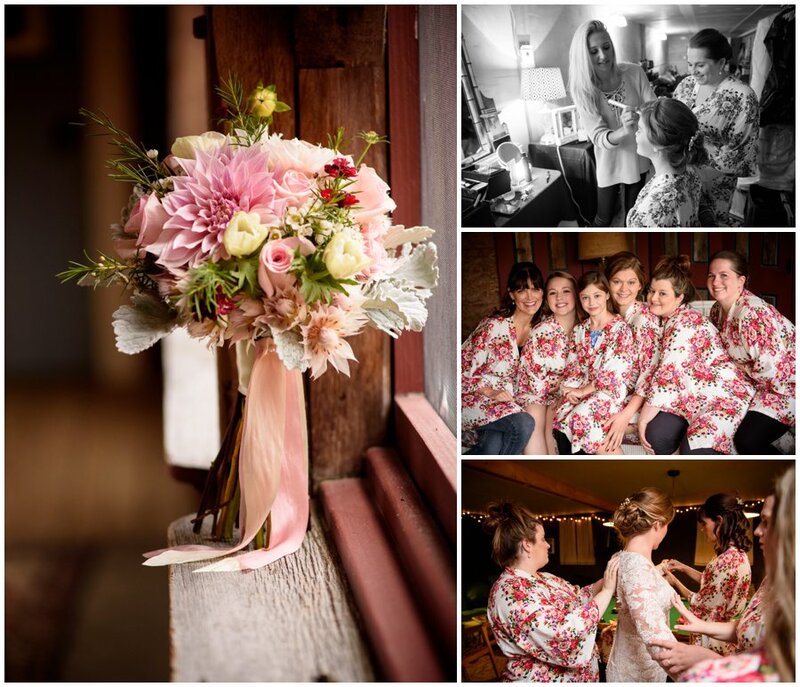 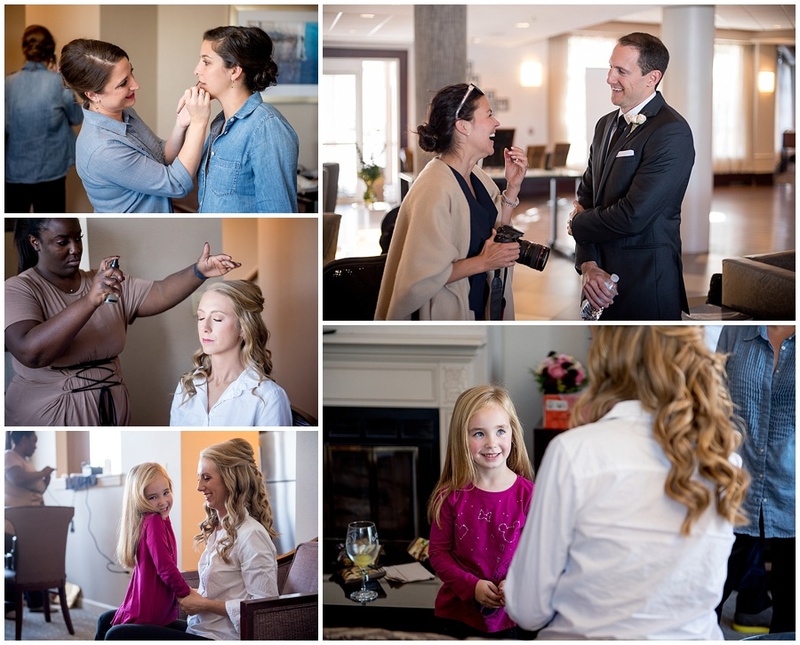 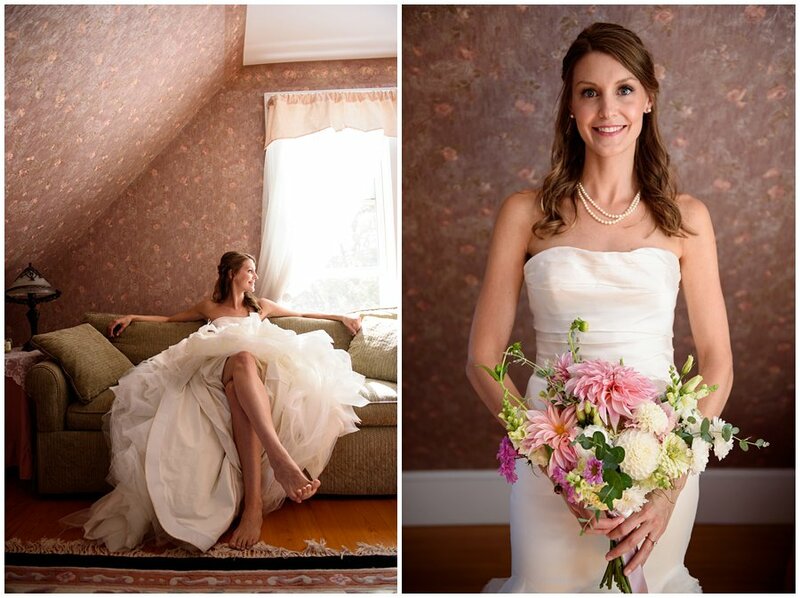 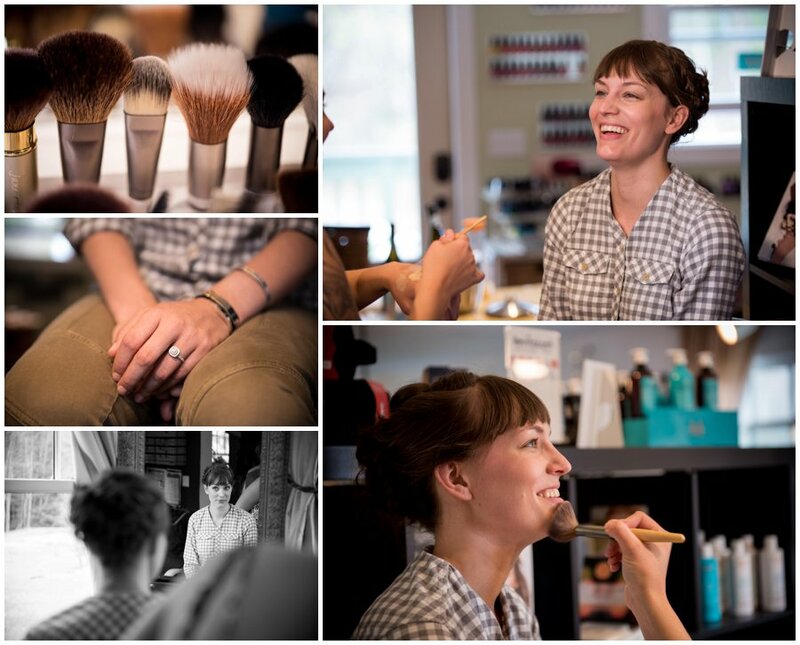 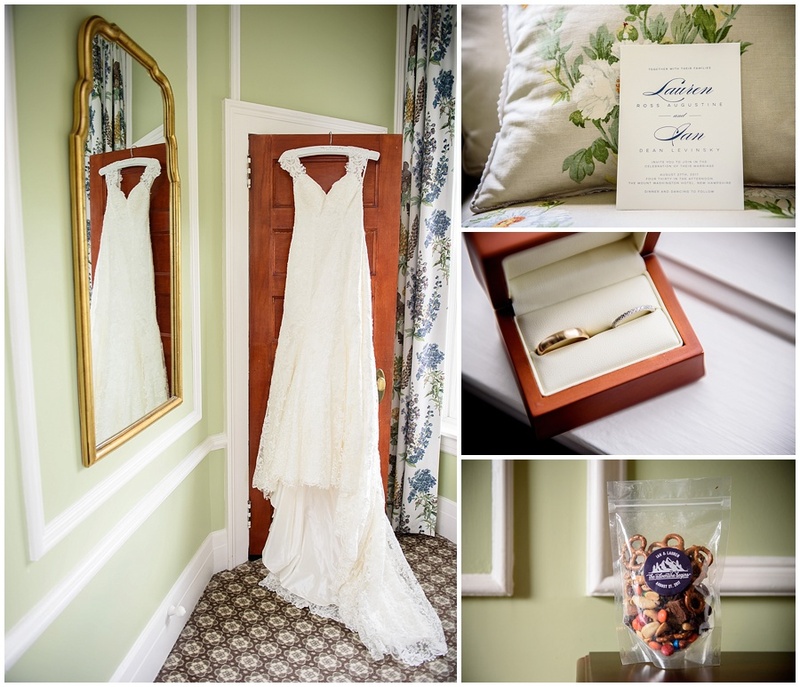 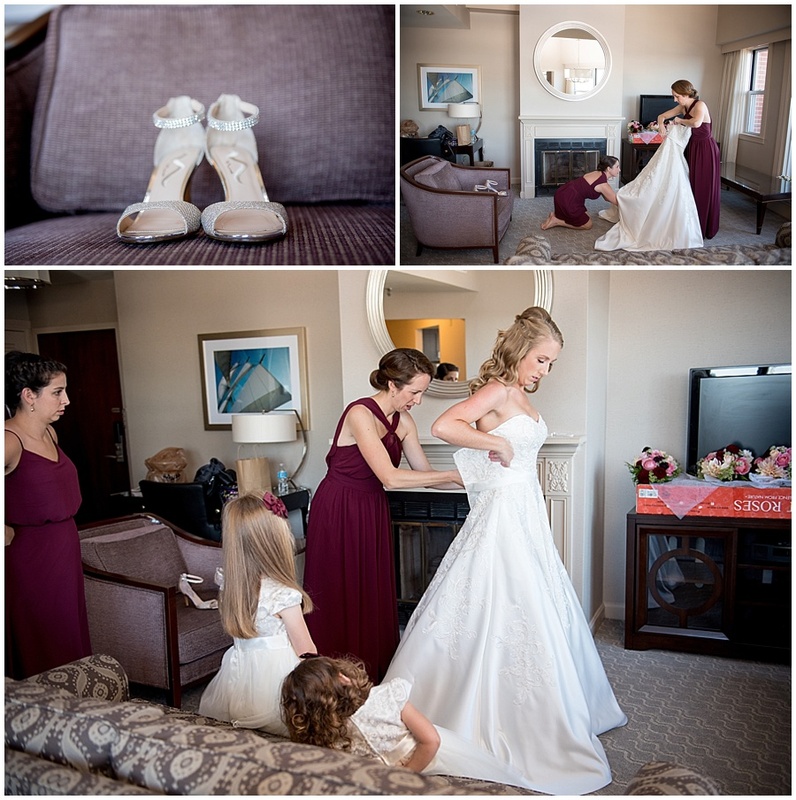 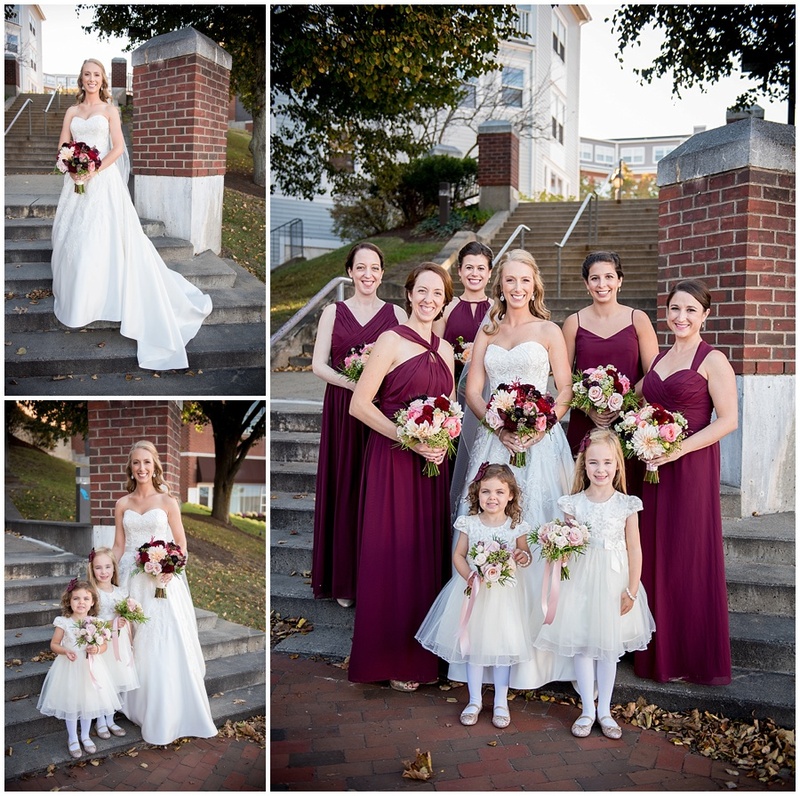 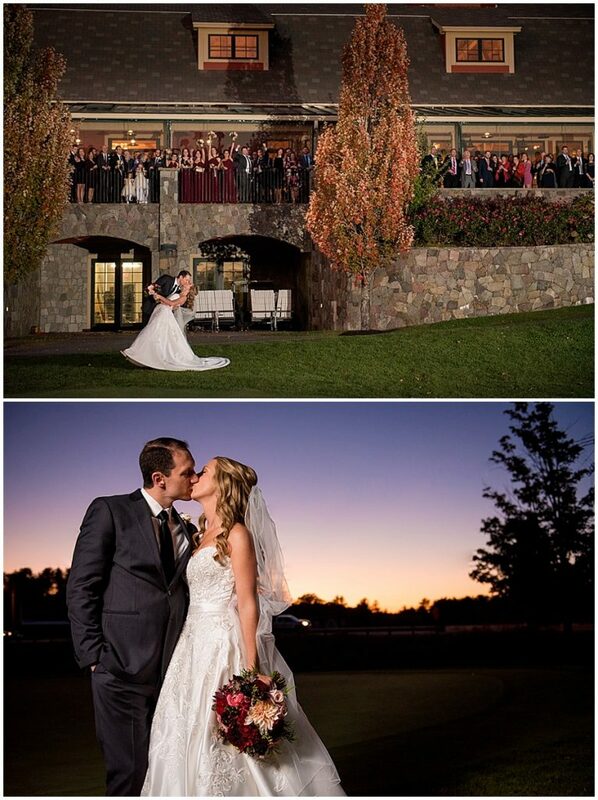 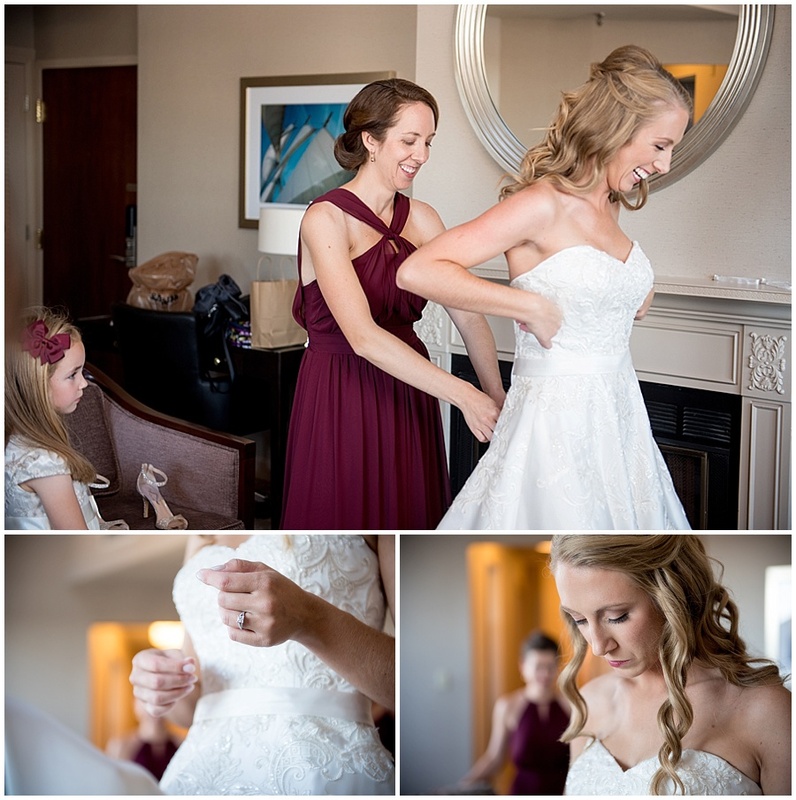 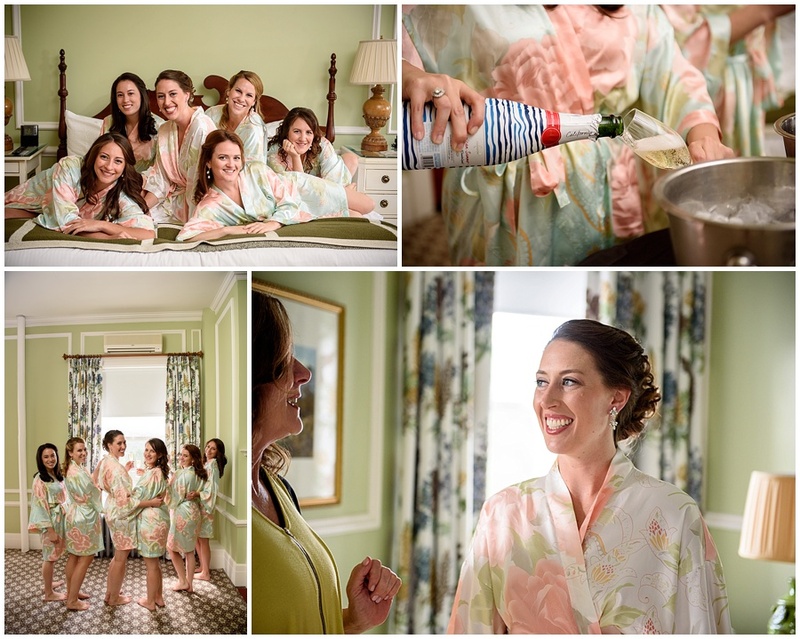 Lauren got ready at the spa on the property and everything else also happened on site–I mean, if you’ve been to The Mount Washington hotel you know there is no reason you’d ever want to leave with the beautiful wrap around porch, the mountain views, and the old mansion charm inside! 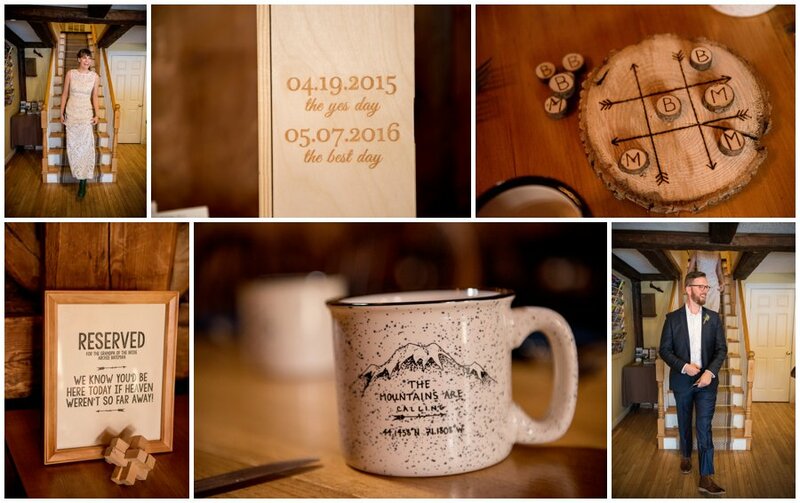 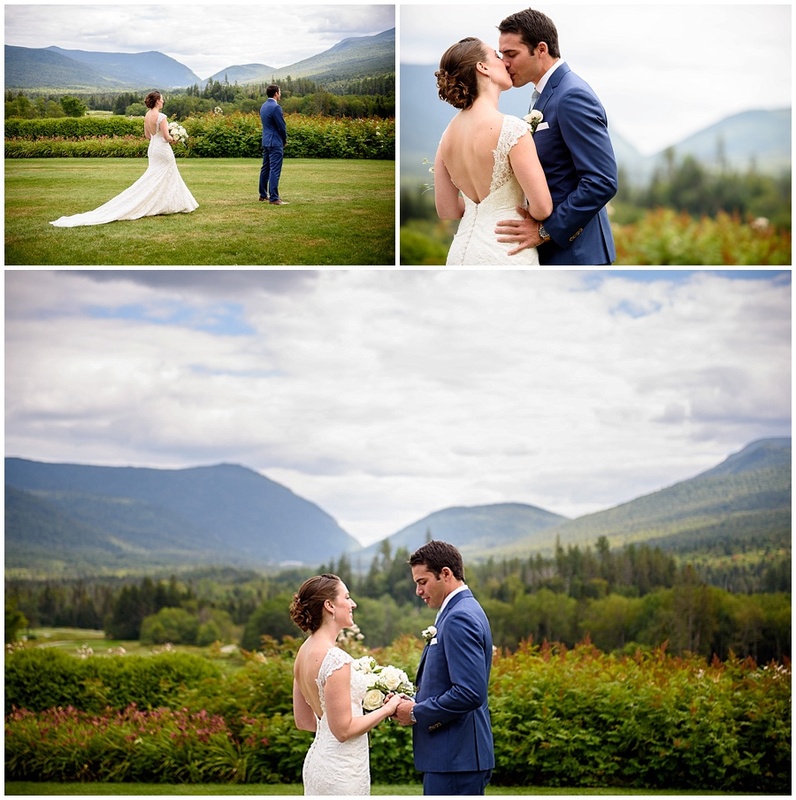 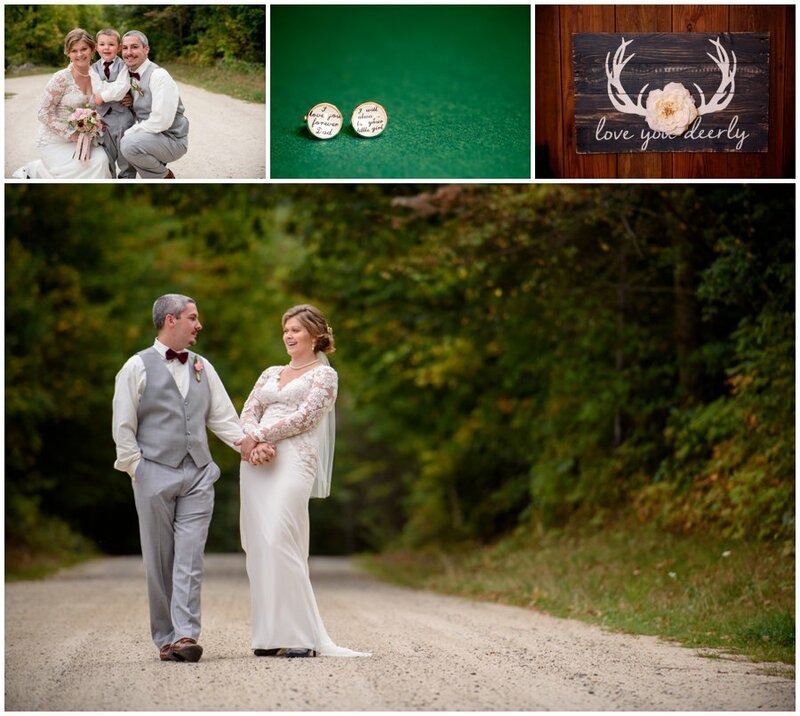 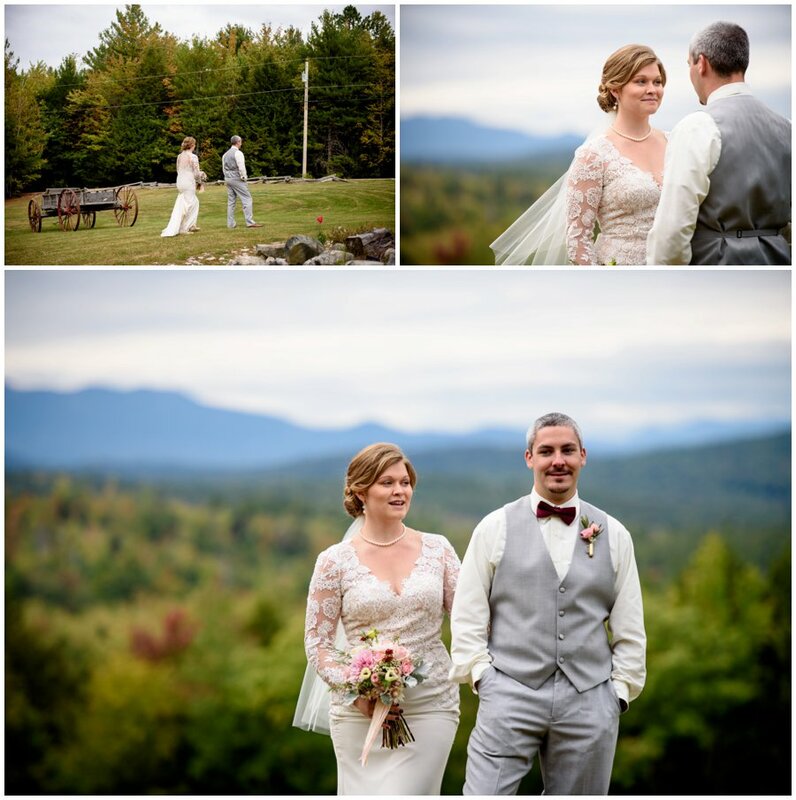 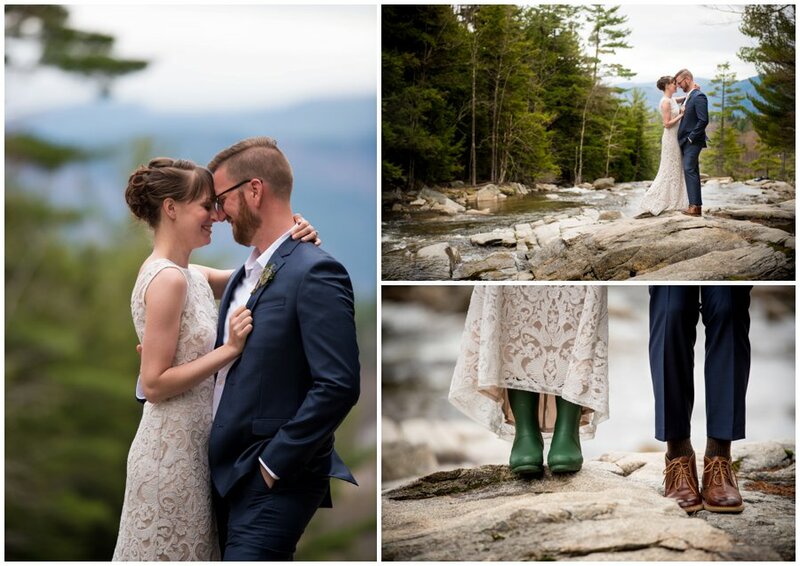 Lauren and Ian asked us for advice for the first look location and just said with their love of hiking in the White Mountains they just really wanted to highlight the views! 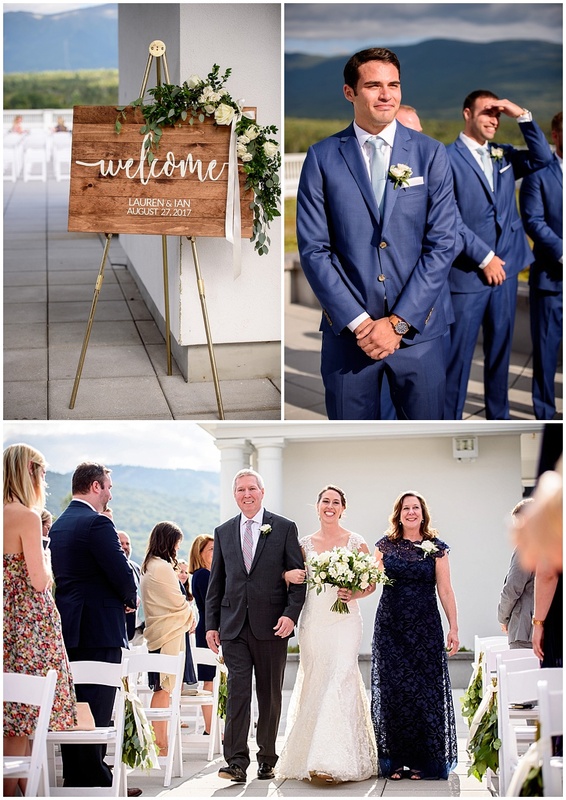 We thought the lawn under the South Veranda fit the bill pretty perfectly seeing as their ceremony on the Jewel Terrace was going to highlight the view of Mt. 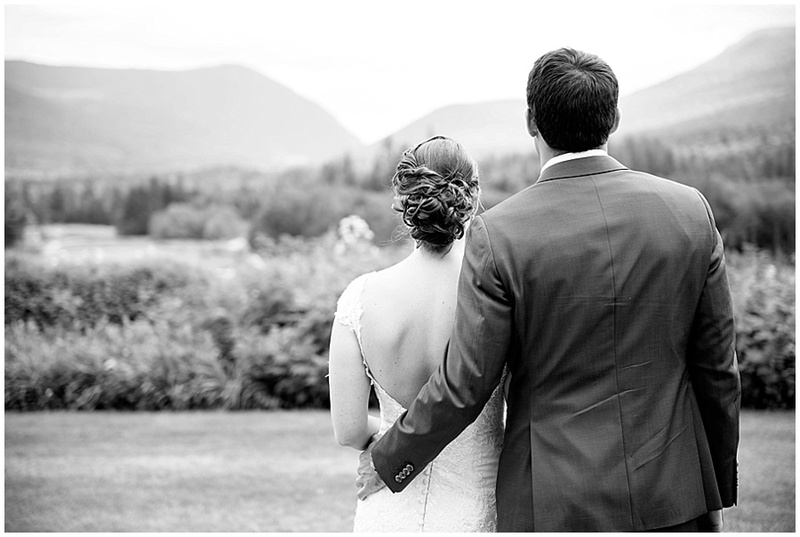 Washington later in the day! 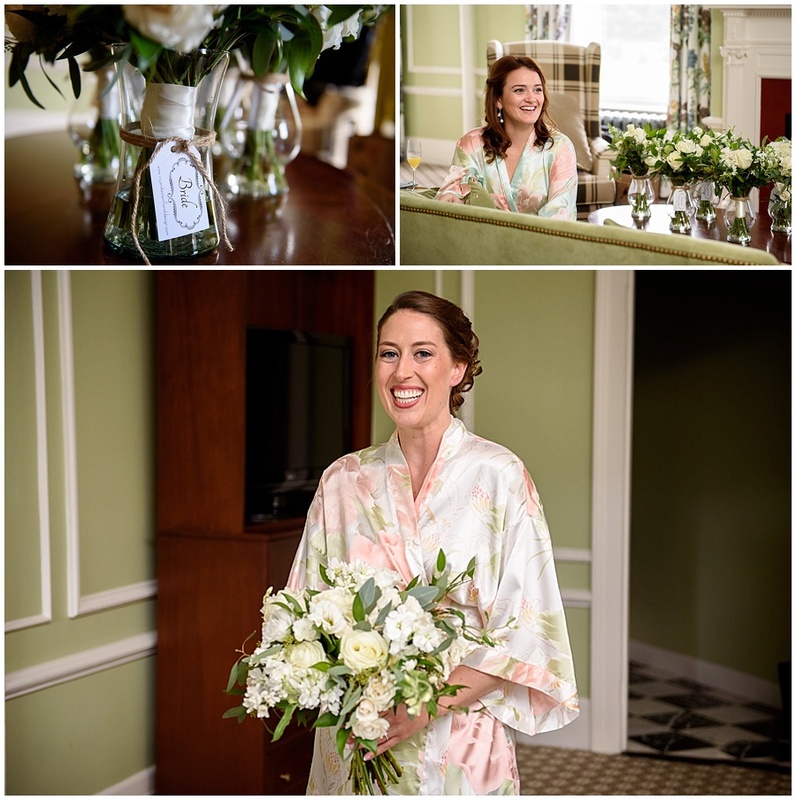 Marjorie was the planner from the hotel for the day and she is literally worth her weight in gold…carrying purses, pinning the beautiful flowers from Ivy and Aster Floral Designs, and making sure everything was running smoothly for the whole day! 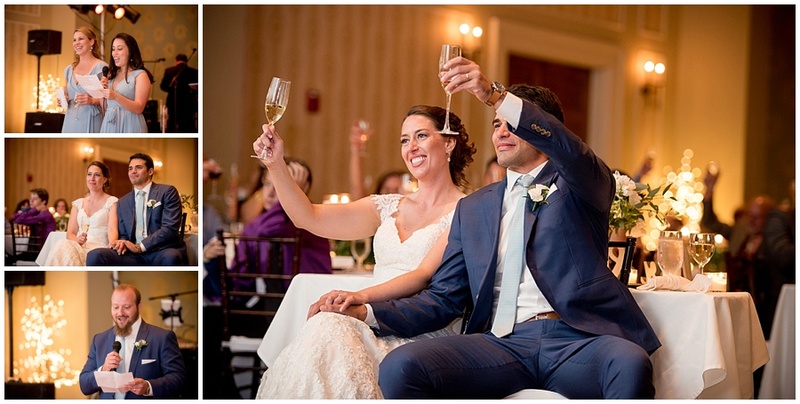 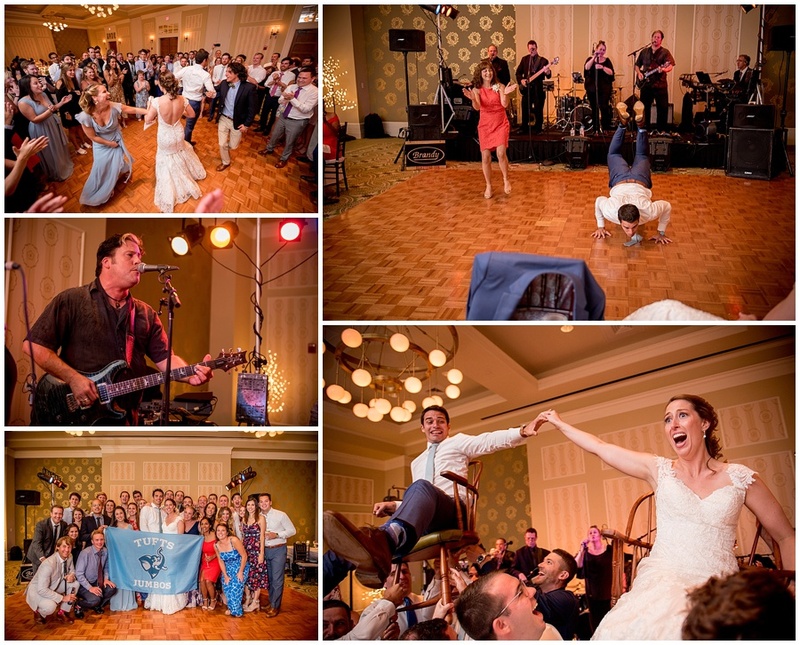 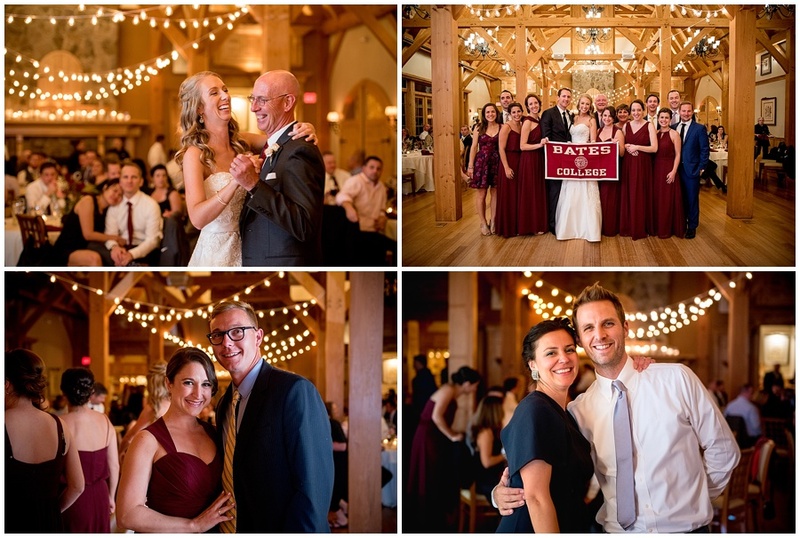 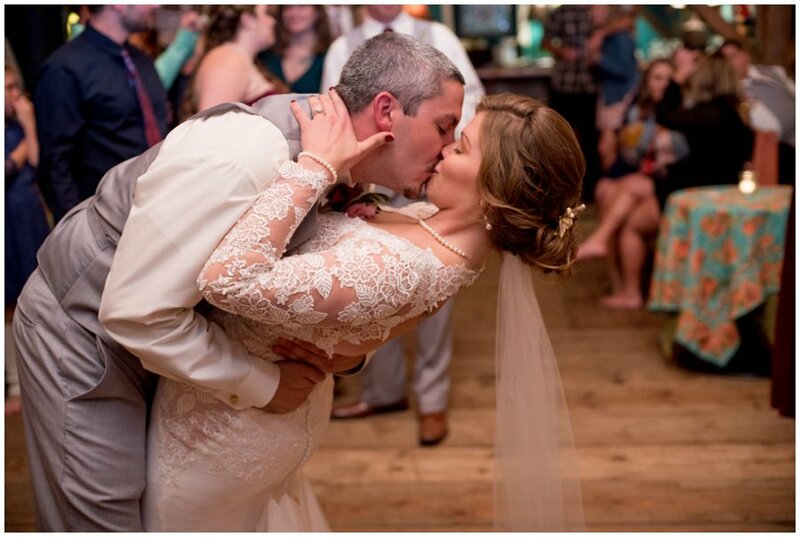 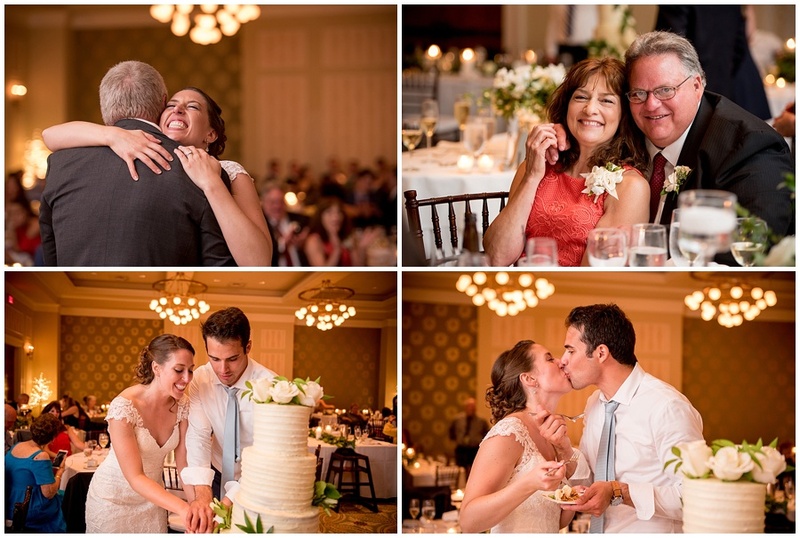 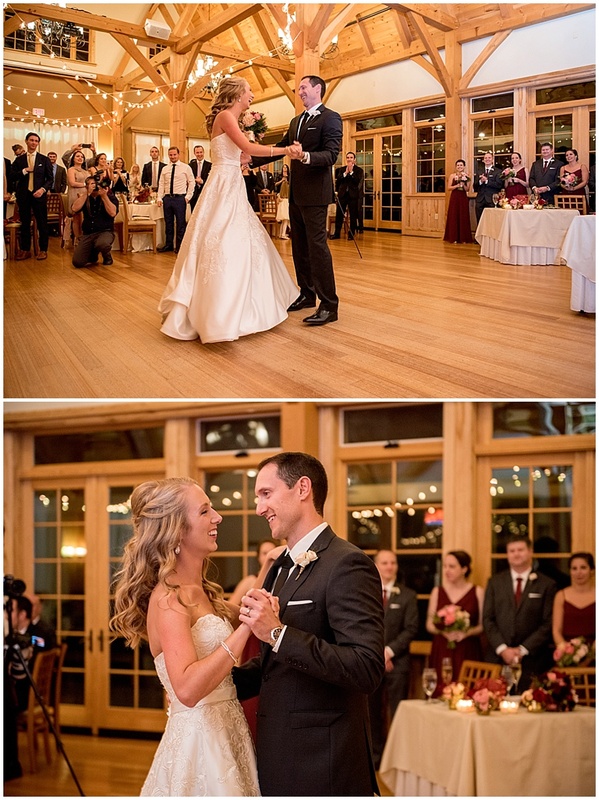 The reception in the Presidential Ballroom could not have been more magical–Mike and I had a band for our own wedding and have a soft spot for the liveliness they bring to the party! 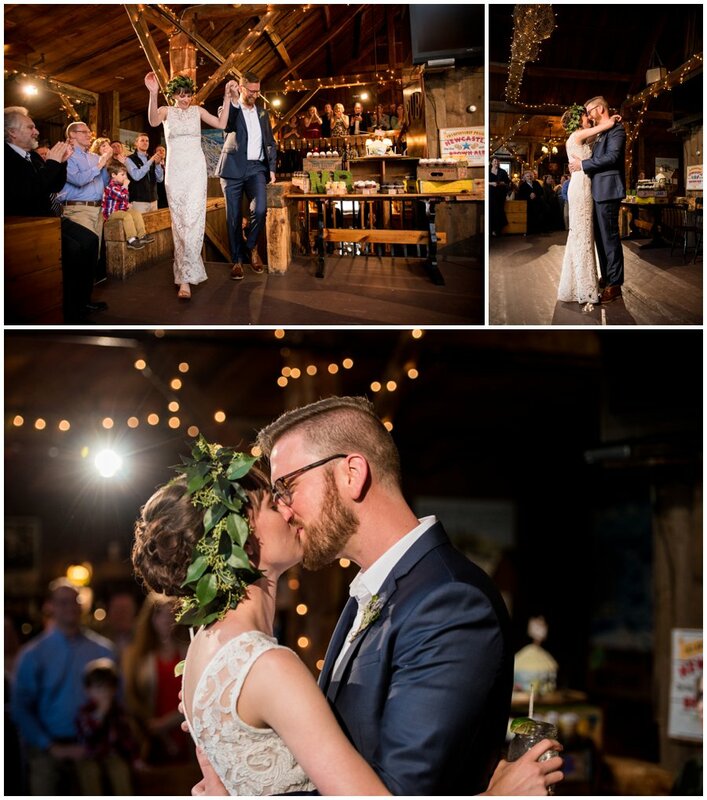 Brandy Band definitely was the life of the party and got everyone up and dancing and having a good time! 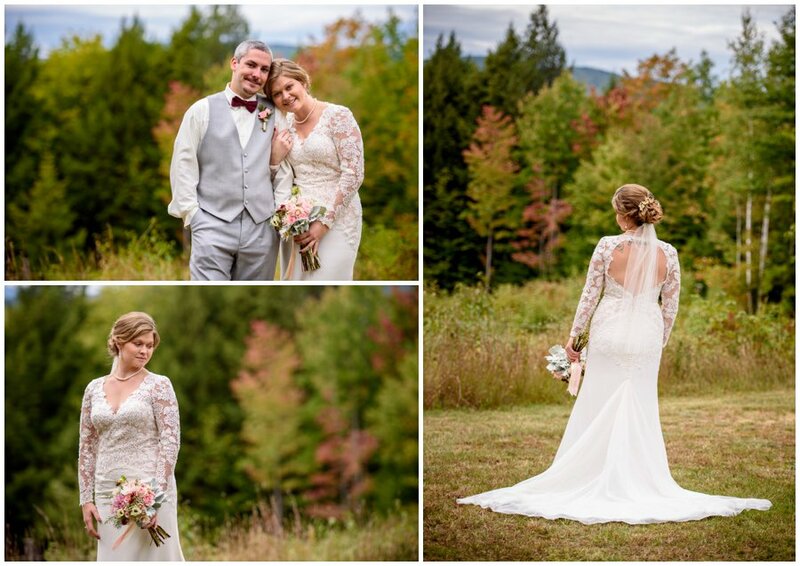 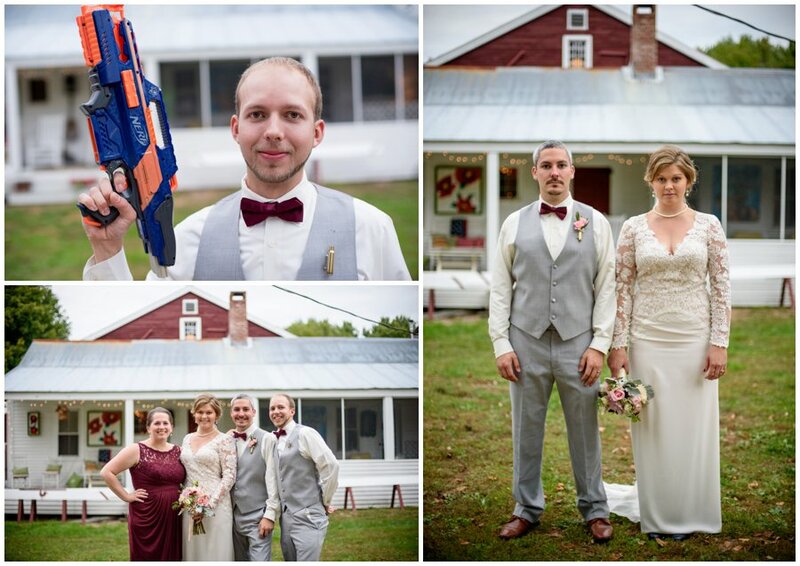 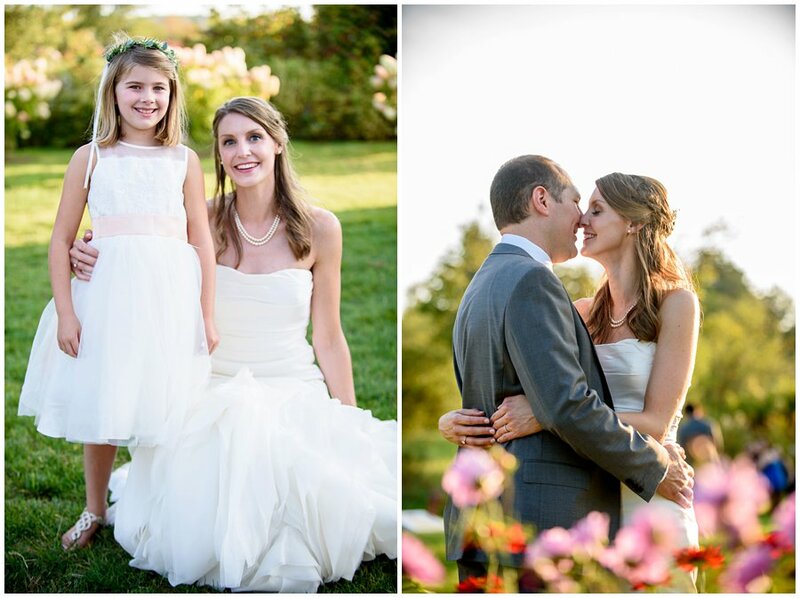 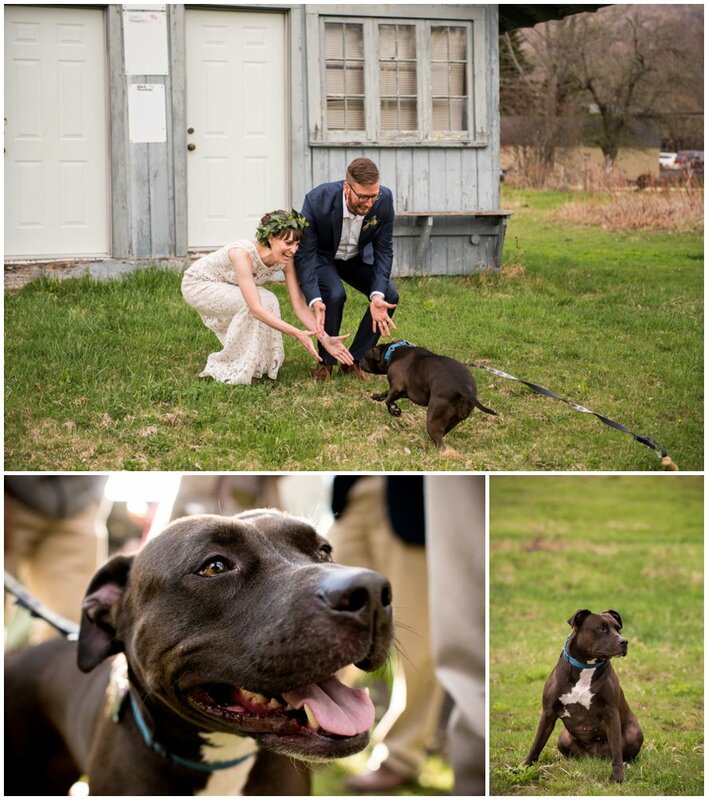 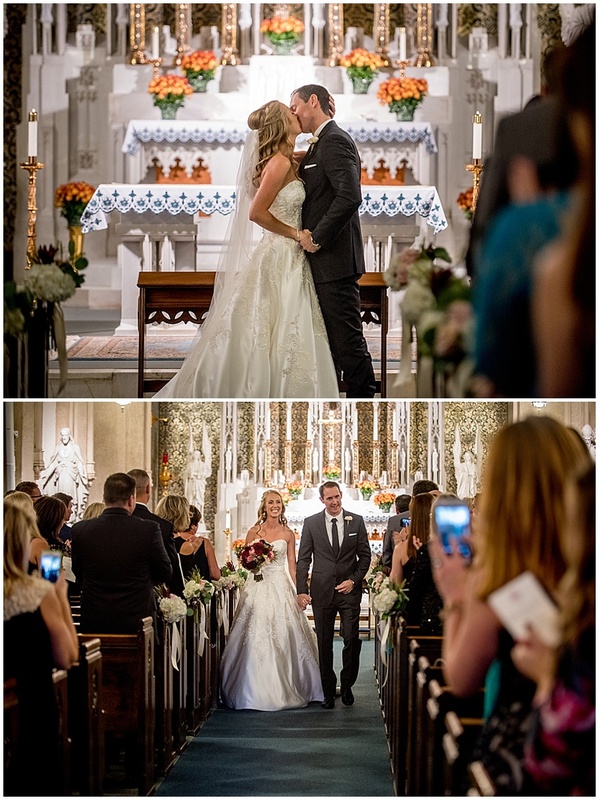 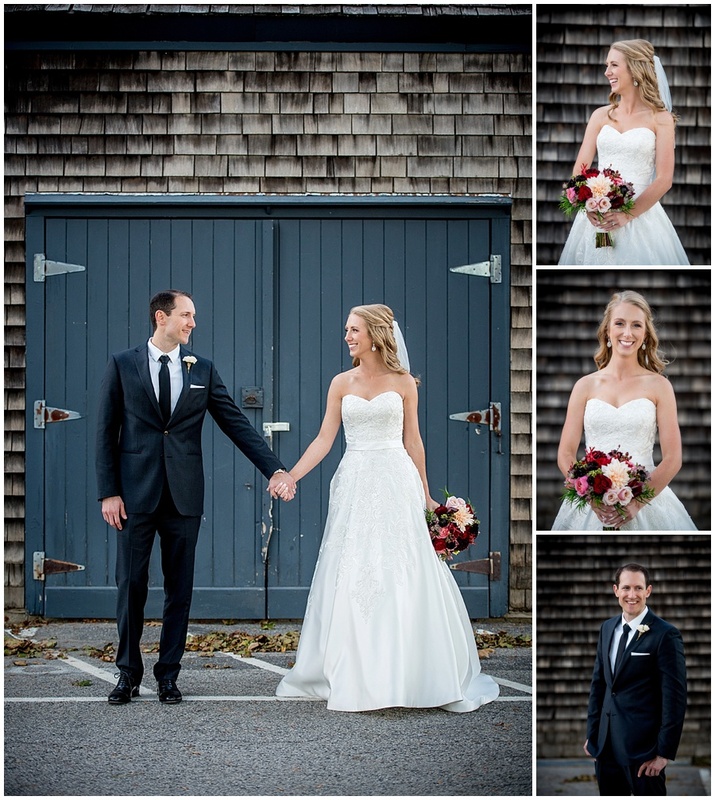 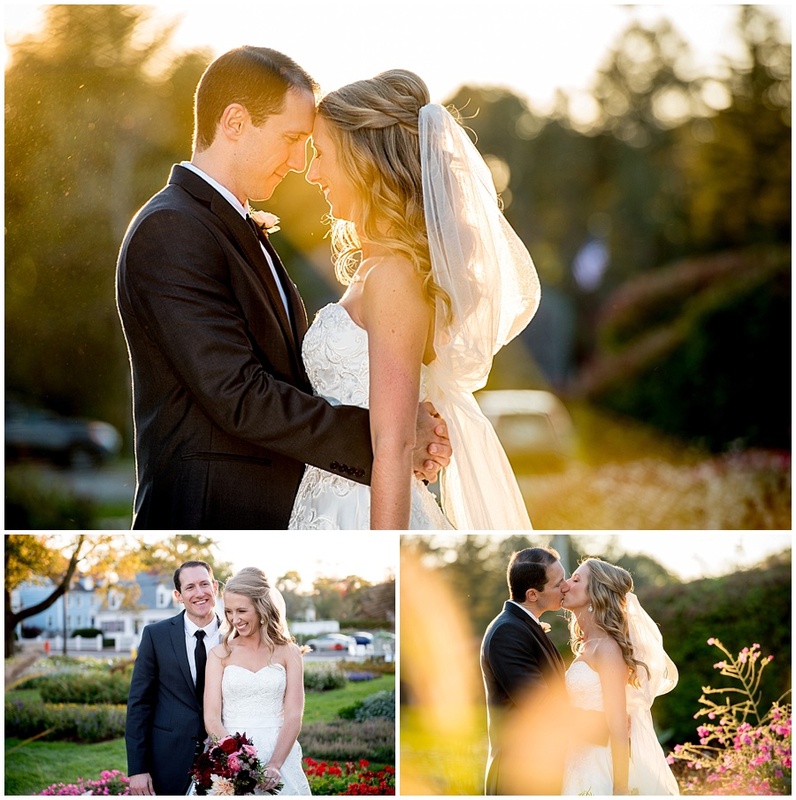 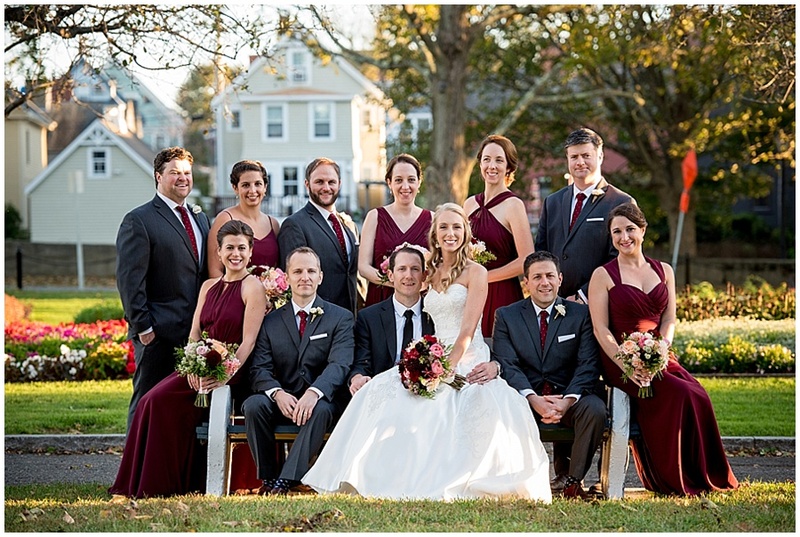 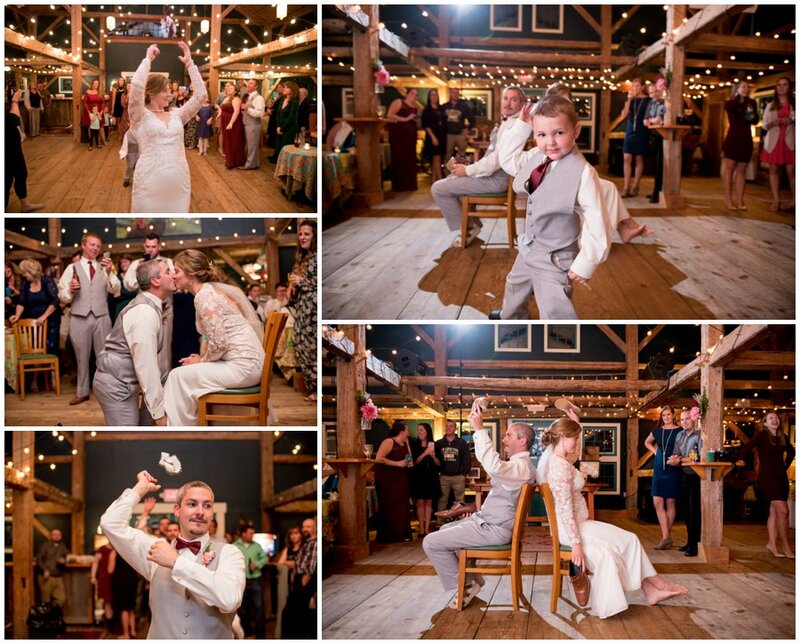 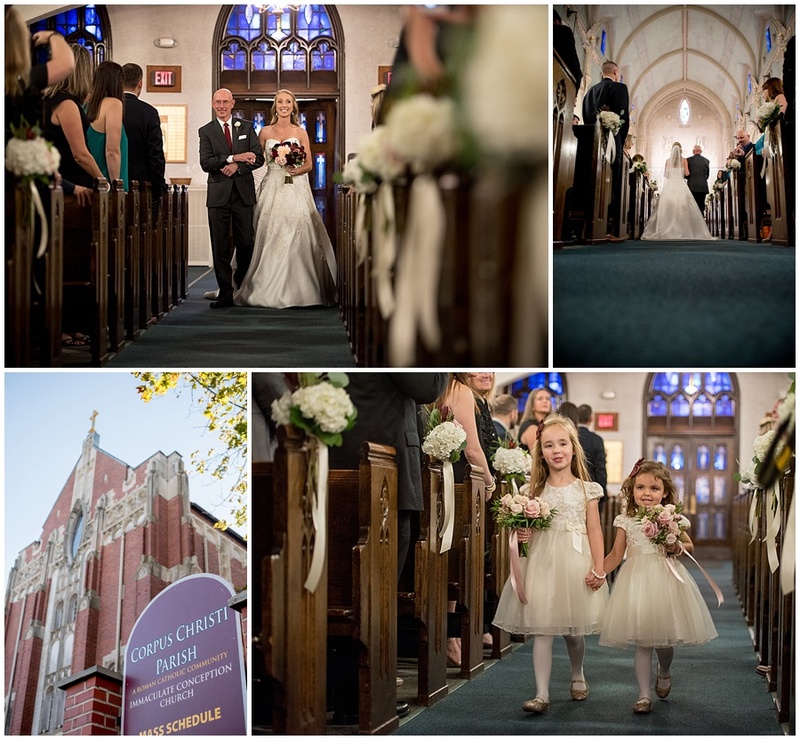 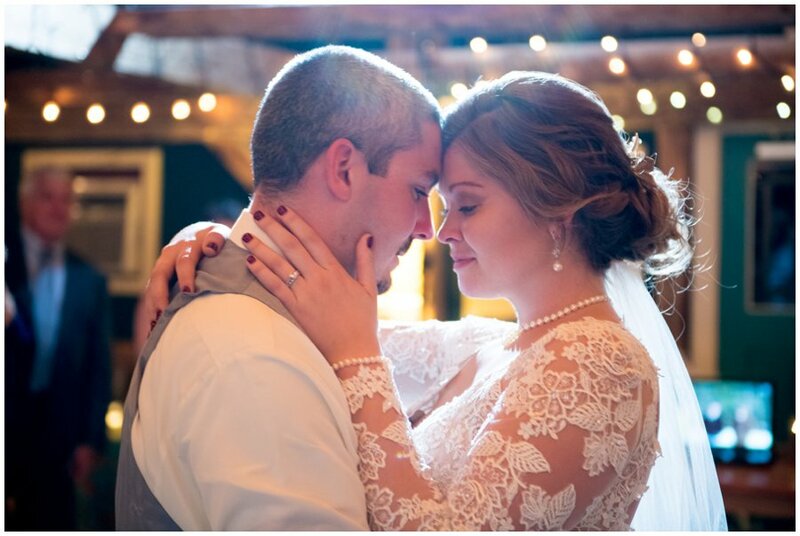 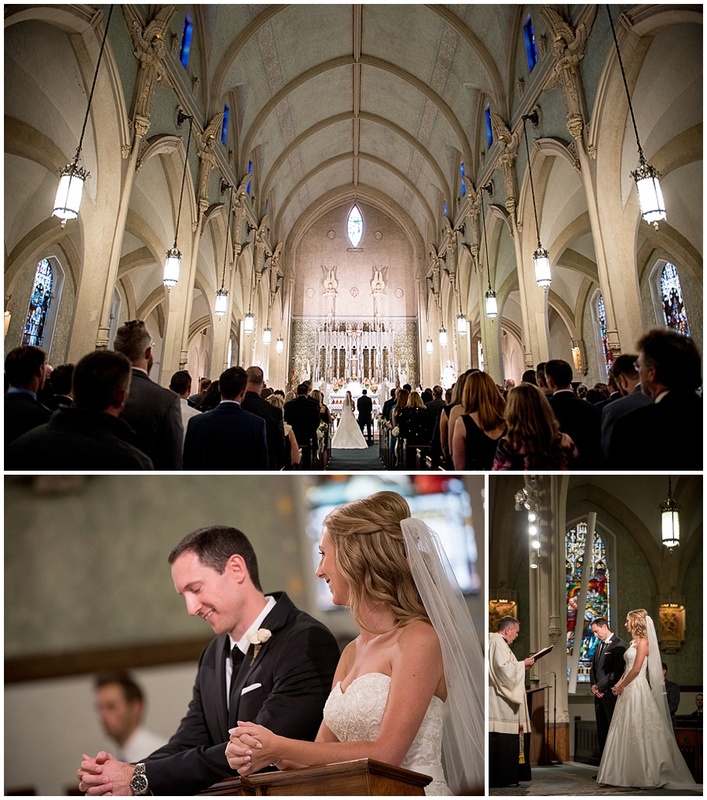 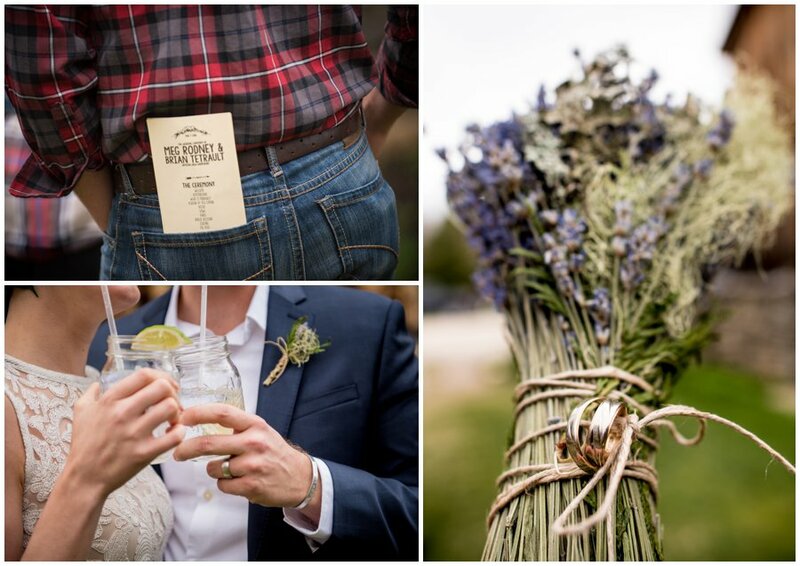 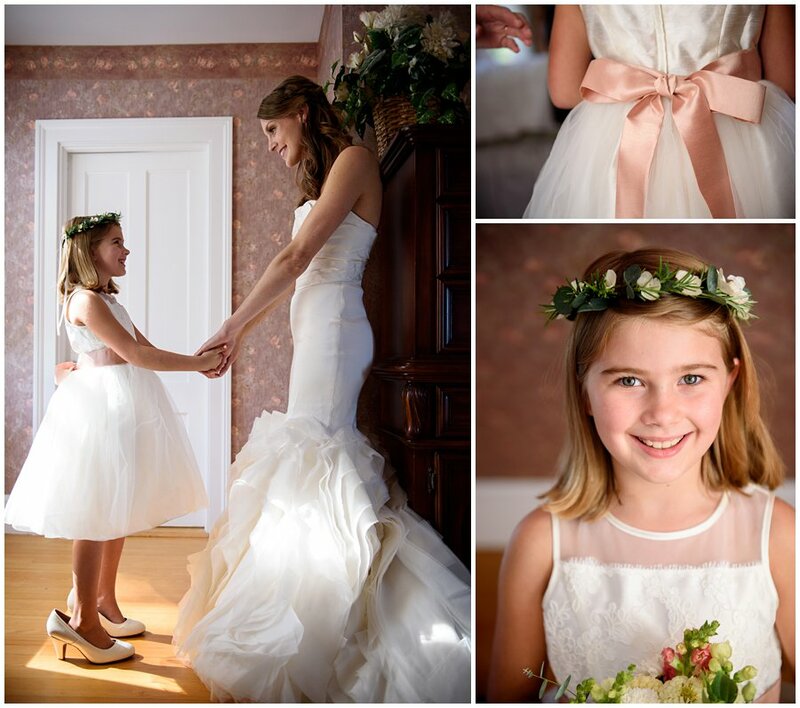 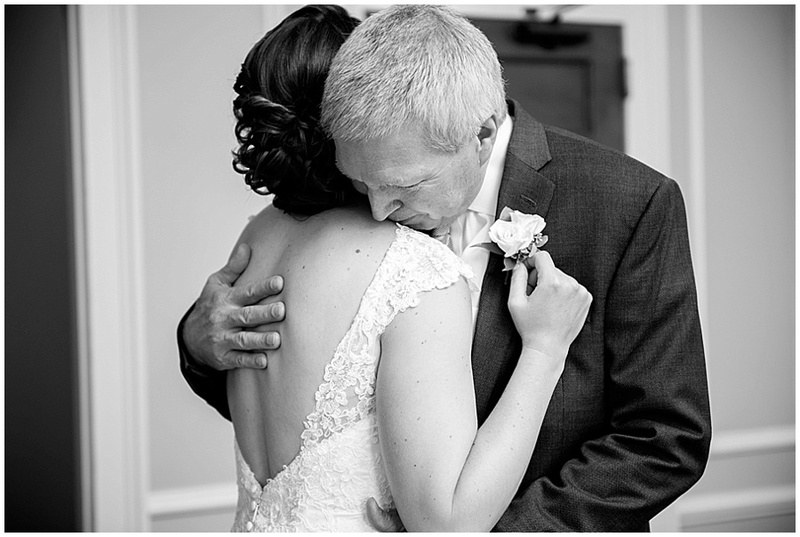 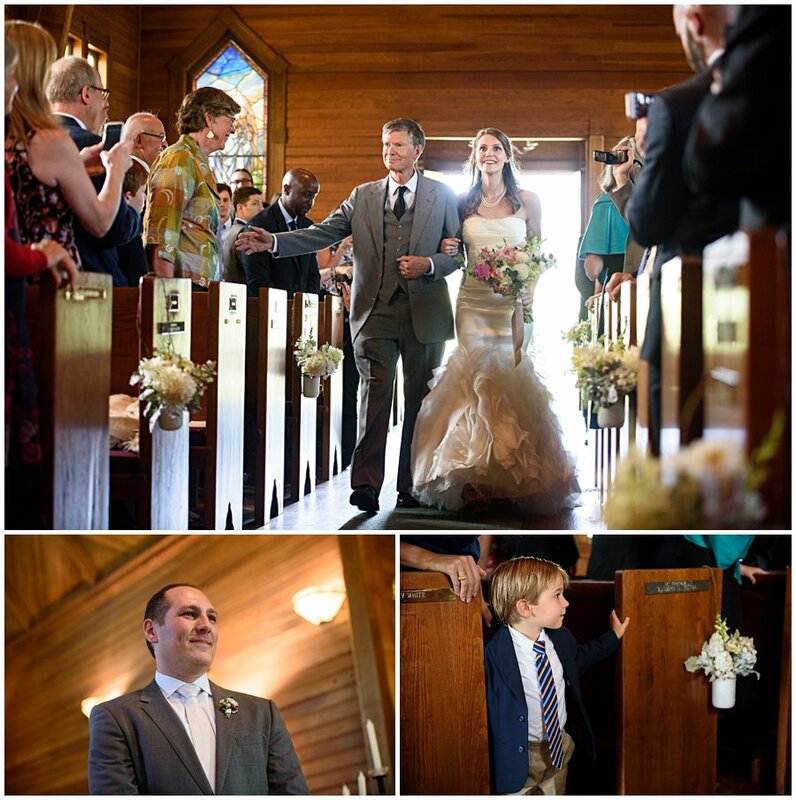 Sit back and scroll….I had a hard time narrowing down the choices for this post because they had such a beautiful day! 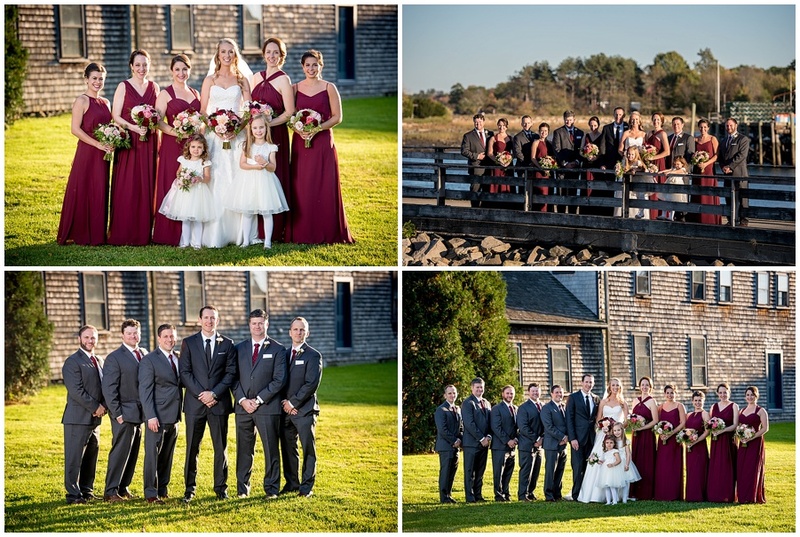 We first heard from Brianna around Christmas time the year before she was married–she was a friend of a friend and we knew that her wedding was going to be absolutely beautiful at the Immaculate Conception at Corpus Christi Parish in Portsmouth, NH with a reception to follow at the Red Barn at Outlook Farm in South Berwick, ME with formal portraits at Prescott Park in Portsmouth! 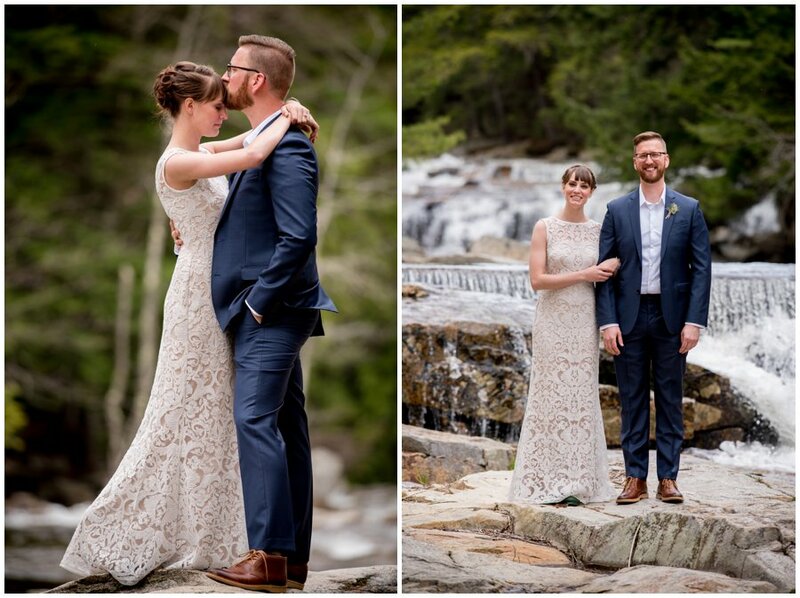 We really love it when we get to meet a new couple and capture them in places that are new to us…there is something magical about finding new spots to create fresh art! 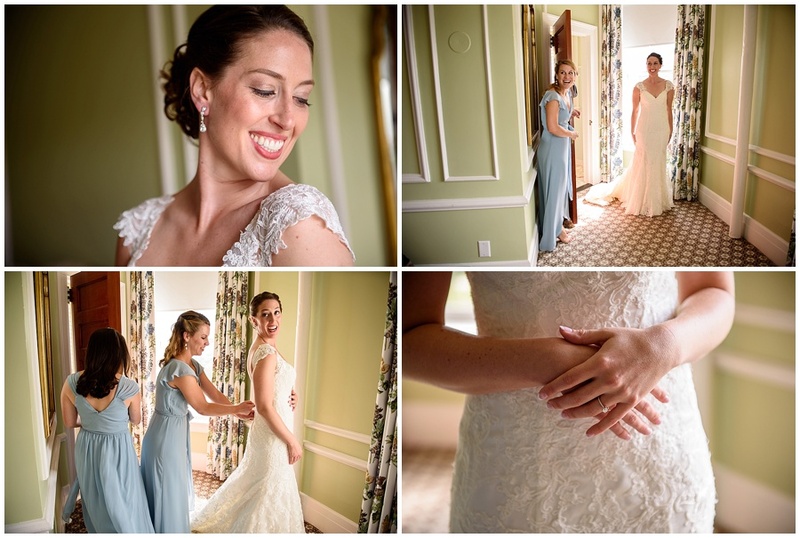 We met up with the couple for getting ready images at the Sheraton Portsmouth Hotel in Portsmouth, NH where we got to see Liz who was the match maker in this couple/photographer relationship…and Julian of Juharo Productions who just happens to be Brianna’s cousin and an amazing videographer who we’ve now shot three weddings with…small world made even smaller with this two degree connection! 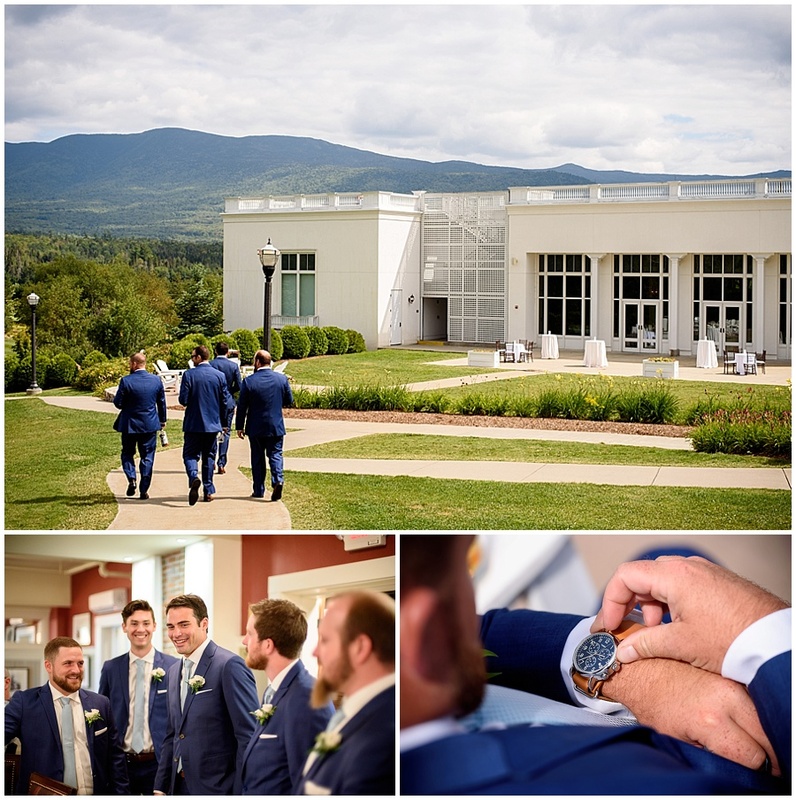 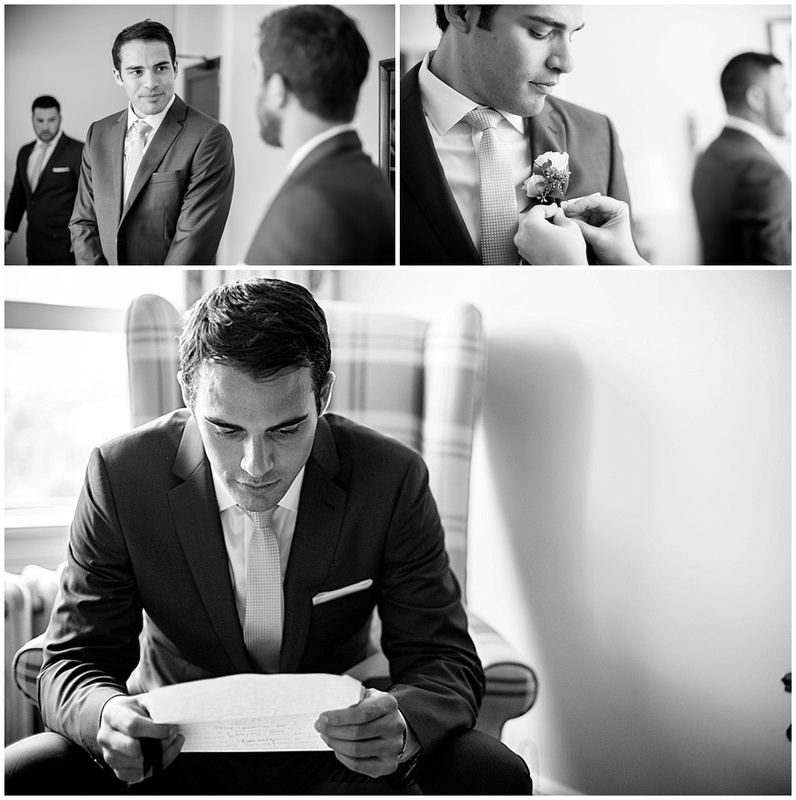 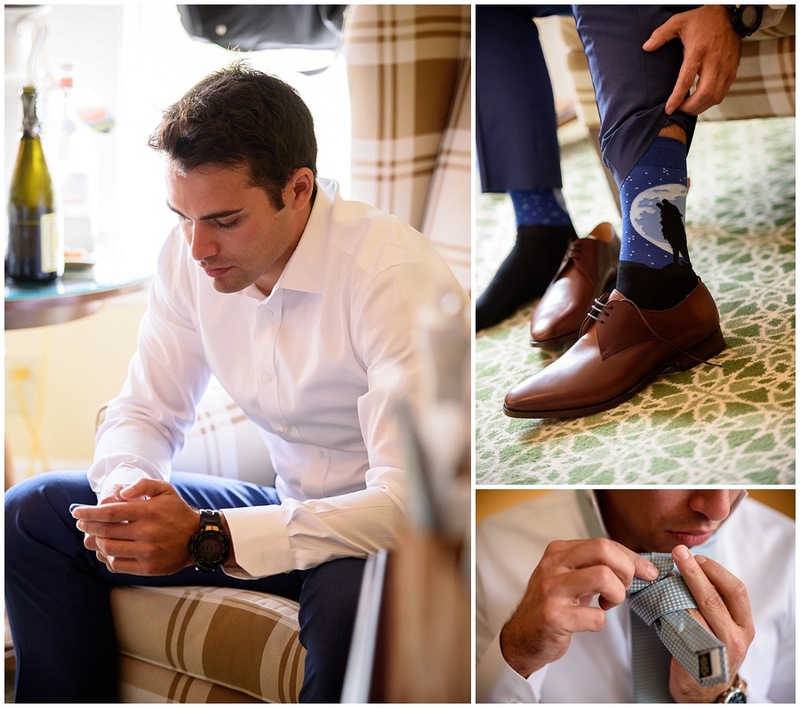 There are some weddings that you go to that just have such unbelievable flow that there isn’t a moment where you wonder what will happen next…and those weddings are often the ones with an unbelievable planner pulling strings and making magic happen behind the scenes! 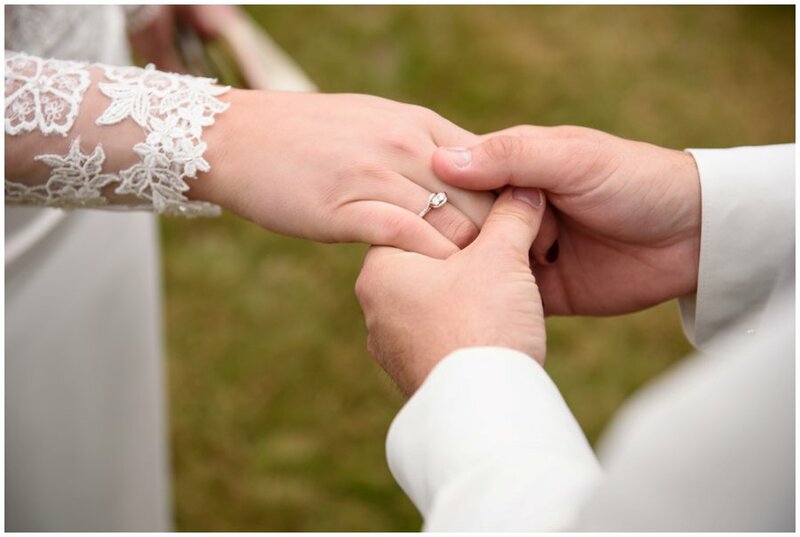 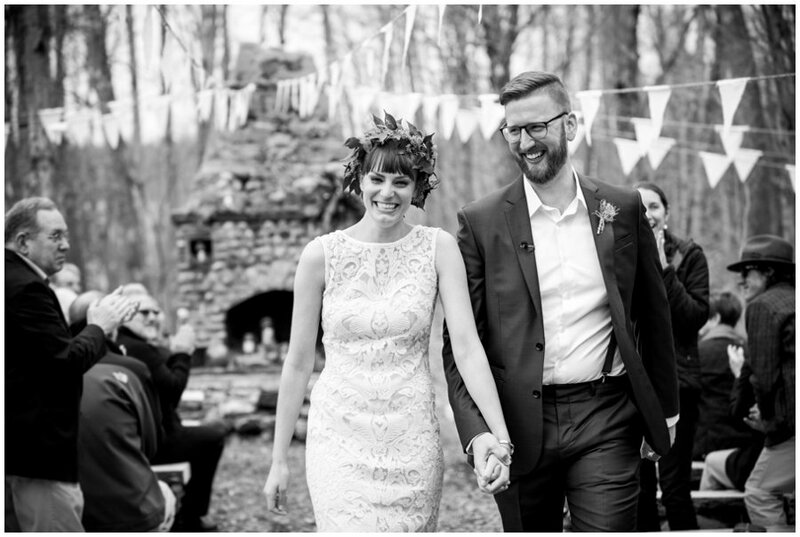 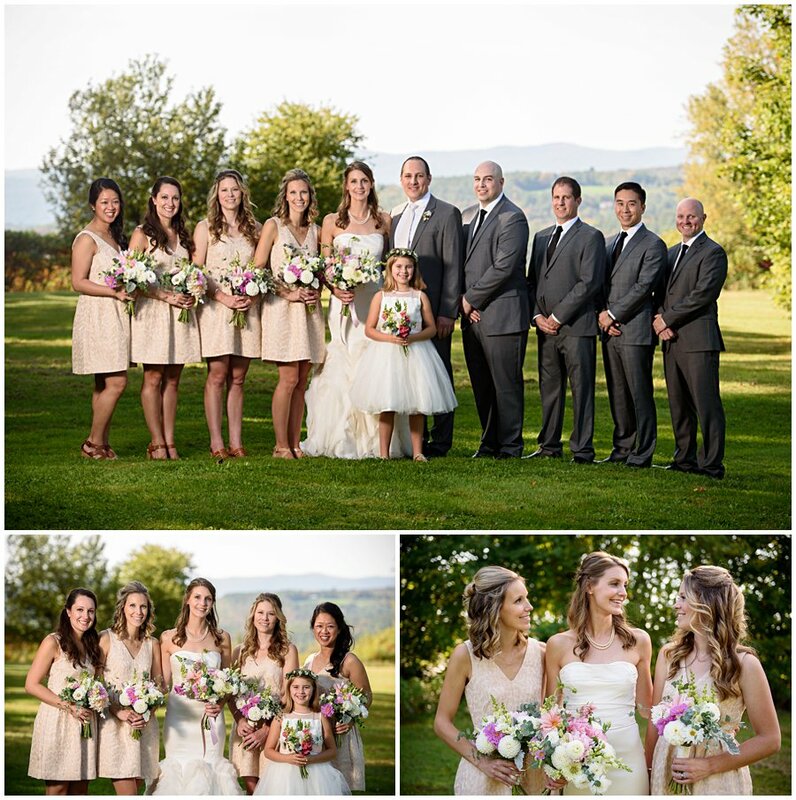 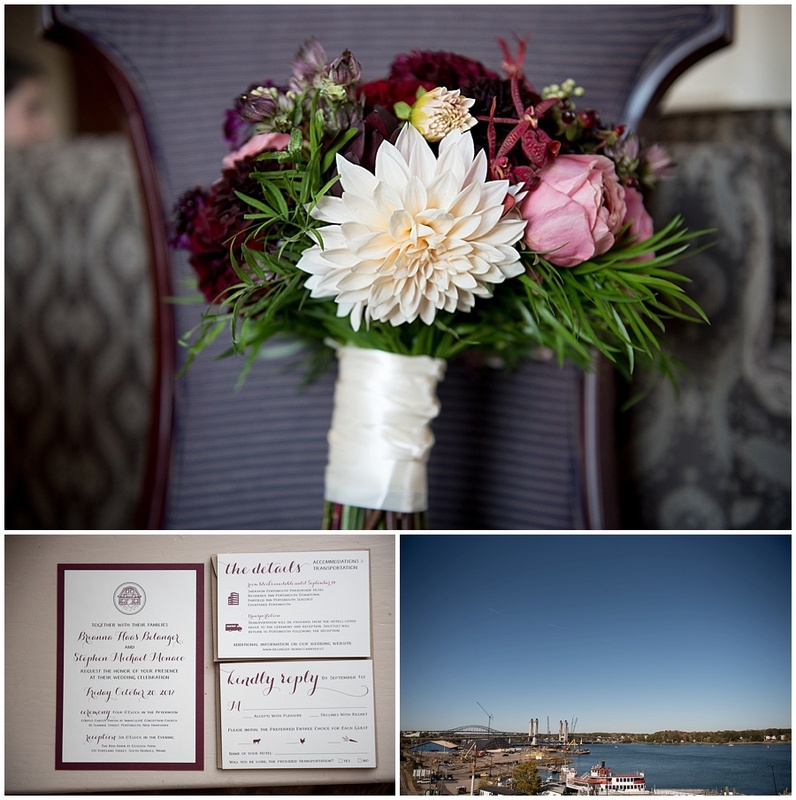 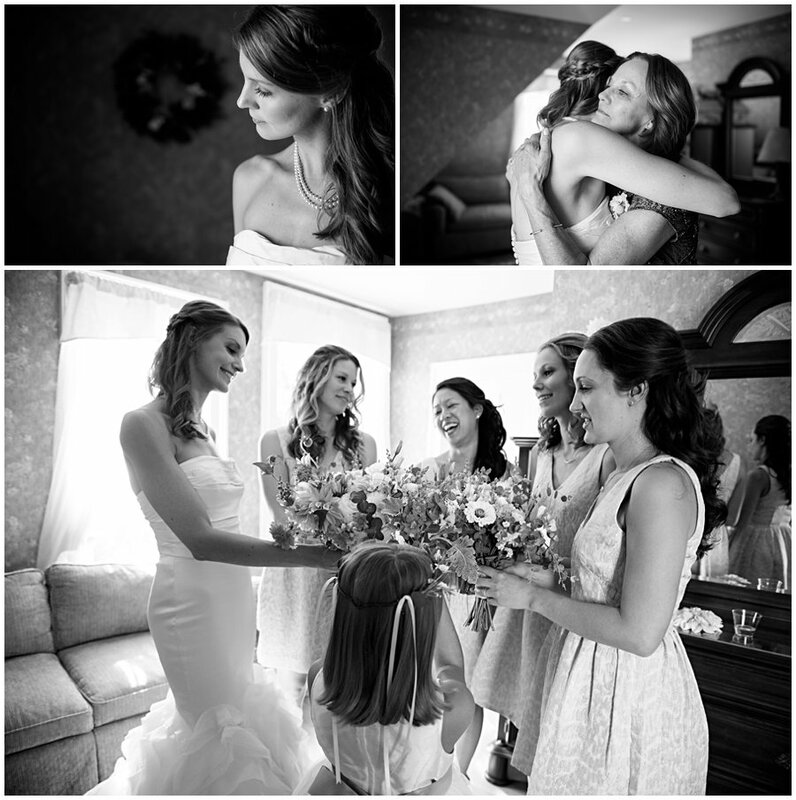 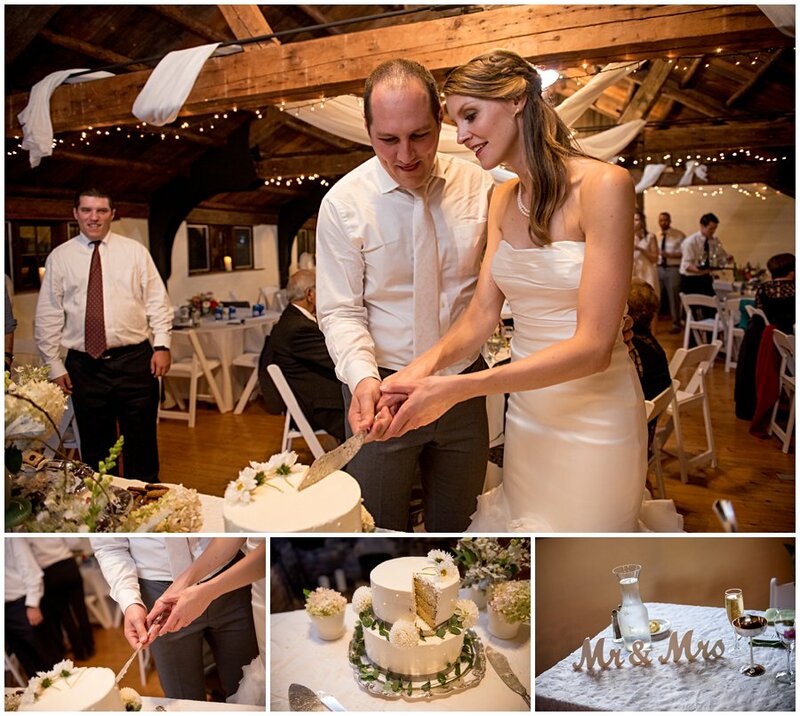 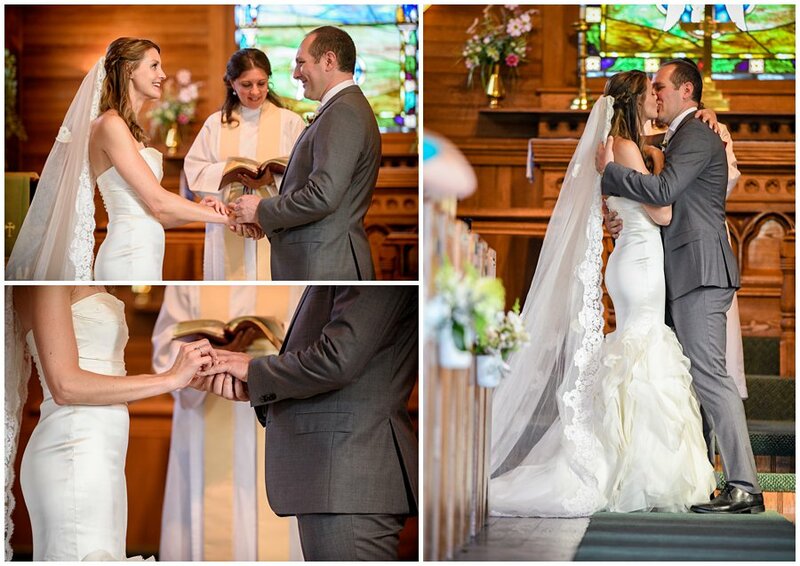 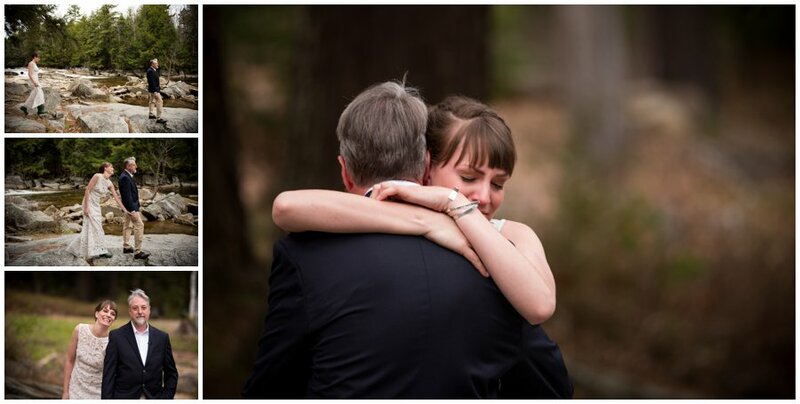 When we met Melanie of Blissful Beginnings at Brianna and Steve’s wedding we knew that this planner working for someone who plans events herself was top notch–with years of experience this wedding was stress free and perfectly planned.